本发明提供一种CMP研磨液、基板研磨方法和电子部件。 The present invention provides a CMP polishing liquid, the polishing method of the substrate and the electronic component. 所述CMP研磨液为将第1液和第2液混合使用的CMP研磨液，第1液含有包含氧化铈粒子的铈系研磨粒、分散剂和水，第2液含有聚丙烯酸化合物、表面活性剂、磷酸化合物和水，第1液的pH为7.0以上，第2液的pH为6.5以上，以磷酸化合物的含量达到规定范围的方式混合第1液和第2液。 The CMP polishing liquid for the CMP polishing liquid to the first liquid and the second liquid mixture, a first liquid containing a cerium-based abrasive grain comprises cerium oxide particles, a dispersant and water, a second liquid containing a polyacrylic acid compound, a surfactant agent, a phosphoric acid compound and water, pH of the first liquid is 7.0 or more, pH of the second solution is 6.5 or more, a content of the phosphate compound mixture within a predetermined range reaches the first liquid and the second liquid. 本发明是原申请的申请日为2010年12月10日、申请号为2010800289134、发明名称为《CMP研磨液、基板研磨方法和电子部件》的中国专利申请的分案申请。  The present invention is an original application is filed December 10, 2010, Application No. 2010800289134, entitled "CMP polishing liquid, and a substrate polishing method of an electronic component" a divisional application of the Chinese patent application. 本发明涉及CMP研磨液、基板研磨方法和电子部件。  The present invention relates to a CMP polishing liquid, the polishing method of the substrate and the electronic component. 现在的超大规模集成电路中具有进一步提高安装密度的倾向，各种微细加工技术被研究、开发，设计规则方面已经达到了亚半微米（sub-half micron)级别。  Current VLSI tends to further increase the mounting density, various microfabrication techniques are the research, development, design rules have reached subhalfmicron (sub-half micron) level. 为了满足这样苛刻的微细化要求而开发的技术之一中，有CMP (Chemical Mechanical Polishing,化学机械研磨）技术。 To meet such stringent requirements of miniaturization technology developed one, there is CMP (Chemical Mechanical Polishing, chemical mechanical polishing) technique. 该CMP技术通过在半导体装置的制造工序中将实施曝光的层几乎完全平坦化，能够减轻曝光技术的负担，使成品率稳定在较高水平。  The CMP technique implemented by the layer exposed in the manufacturing process of the semiconductor device is almost completely flattened exposure technique can reduce the burden, the yield stable at a high level. 因此，CMP技术在例如进行层间绝缘膜、 BPSG膜的平坦化，浅沟槽隔离（shallow trench isolation)等时，是必须的技术。 Thus, the CMP technology in the insulation film, the planarization of the BPSG film, shallow trench isolation (shallow trench isolation) and the like for example, an interlayer, a technology necessary. 现在，通常使用的CMP研磨液是以氧化硅膜为主要研磨对象的CMP研磨液，通常情况下，氧化硅膜、多晶硅膜与氮化硅膜相比，具有被5倍以上快速研磨的特性。  Now, the CMP polishing liquid is a silicon oxide film is generally used as the main object to be polished in the CMP polishing liquid, usually, a silicon oxide film, a polysilicon film as compared with the silicon nitride film, is polished with rapid than 5 times features. 另一方面，对于氮化硅膜而言，尚不存在能够以实用的速度进行研磨的研磨液。  On the other hand, for the silicon nitride film, it is not the presence of the polishing liquid can be performed at a practical speed. 因此，存在如专利文献1那样的、通过添加1. 〇质量％以上的磷酸以增大氮化硅膜的研磨速度而使氮化硅膜的研磨工序能够实用化的技术。 Accordingly, there is Patent Document 1, the silicon nitride film by the addition of 1 mass% phosphoric acid billion to increase the polishing rate of the silicon nitride film polishing step can be practical technique. 近年来，已经提出了各种使用CMP技术的电路形成工艺，作为其中之一，存在研磨氧化硅膜和氮化硅膜、并于作为截止膜（stopper film)的多晶硅膜露出时停止研磨的工艺。  In recent years, circuits have been proposed various techniques for forming the CMP process, as one wherein the presence of a grinding silicon oxide film and a silicon nitride film, and exposed to stop the polysilicon film (stopper film) as an off membrane the grinding process. 更具体而言，存在例如45nm节点以后的、预期能够应用于逻辑（Logic)器件的高介电/金属栅工艺（High-k/metal Gate process,研磨氧化娃膜、氮化娃膜并于多晶娃膜露出时停止研磨的工艺）。 More specifically, for example, the presence of high dielectric after the 45nm node, expected to be applied to the logic (Logic) device / metal gate process (High-k / metal Gate process, the polishing baby oxide film, nitride film and the multi-Wa baby crystal film is exposed during the polishing process is stopped). 前述专利文献1中公开的技术并非是能够将这样的以实用的研磨速度研磨氧化硅膜和氮化硅膜且以多晶硅膜为截止膜来进行研磨的研磨工序实用化的技术。  The aforementioned technique disclosed in Patent Document 1 is not capable of such a polishing rate at a practical polishing a silicon oxide film and a silicon nitride film and a polysilicon film in the off film polishing step of polishing a practical technique. 并且，专利文献1中公开的技术无法应用于相对于多晶硅膜选择性地研磨氧化硅膜和氮化硅膜这2种膜的研磨工序。 Further, the technique disclosed in Patent Document 1 can not be applied with respect to the step of polishing the polysilicon film is selectively polishing a silicon oxide film and a silicon nitride film, two kinds of films. 本发明提供能够提高氧化硅膜和氮化硅膜相对于多晶硅膜的研磨速度、能够应用于以多晶硅膜为截止膜对氧化硅膜、氮化硅膜进行研磨的研磨工序的CMP研磨液，使用了该CMP研磨液的基板研磨方法和具备通过该研磨方法进行研磨而成的基板的电子部件。  The present invention is capable of improving the CMP polishing silicon oxide film and a silicon nitride film with respect to the polishing rate of the polysilicon film, the polysilicon film can be applied to a silicon oxide film, a silicon nitride film polishing step of polishing off membrane solution, the method of polishing a substrate using a CMP polishing liquid and polishing an electronic component formed by the method of polishing a substrate. 即，本发明提供一种CMP研磨液，其为将第1液和第2液混合使用的CMP研磨液， 第1液含有铈系研磨粒、分散剂和水，第2液含有聚丙烯酸化合物、表面活性剂、pH调整剂、 磷酸或磷酸衍生物中的至少一方的磷酸化合物和水，第2液的pH为6. 5以上，以磷酸化合物的含量在以CMP研磨液总质量为基准时达到0. 01~1. 0质量％的方式混合第1液和第2 液。  That is, the present invention provides a CMP polishing liquid, which is a CMP polishing liquid to the first liquid and the second liquid mixture, a first liquid containing a cerium-based abrasive grains, dispersant and water, a second liquid containing a poly acrylic acid compounds, phosphoric acid, and water for at least one of a surfactant, pH adjusting agent, acid or phosphoric acid derivative, pH of the second liquid is 6.5 or more, a content of phosphoric acid compound in the total mass of the CMP polishing liquid reference reached 0.01 ~ 1.0 mass% of the way when the first liquid mixture and the second solution. 这样的本发明的CMP研磨液能够提高氧化硅膜和氮化硅膜相对于多晶硅膜的研磨速度，能够应用于以多晶硅膜为截止膜对氧化硅膜、氮化硅膜进行研磨的研磨工序。  CMP polishing liquid according to this invention can improve silicon oxide film and a silicon nitride film with respect to the polishing rate of the polysilicon film, the polysilicon film can be applied to polishing of a silicon oxide film cutoff film, a silicon nitride film polishing process. 第2液可以含有pKa为8以上的碱性化合物作为pH调整剂。  The second liquid may contain a pKa of 8 or more a basic compound as a pH adjusting agent. 第2液优选含有非离子性表面活性剂作为表面活性剂。  Surfactant second liquid preferably contains a nonionic surfactant as. 这种情况下，能够进一步提高氧化硅膜和氮化硅膜相对于多晶硅膜的研磨速度。 In this case, it is possible to further improve the silicon oxide film and a silicon nitride film polishing rate relative to the polysilicon film. 第1液的pH优选为7. 0以上。  The first liquid preferably has a pH of 7.0 or more. 第1液优选含有氧化铈粒子作为铈系研磨粒。  The first liquid preferably contains cerium oxide particles as abrasive grains cerium. 此外，更优选第1液含有氧化铈粒子作为铺系研磨粒，铺系研磨粒的平均粒径为0. 01~2. 0 μ m。 It is more preferable that the first solution containing cerium oxide particles as abrasive grain-based shop, the shop-based average particle diameter of abrasive grains is 0. 01 ~ 2. 0 μ m.
 第1液优选含有聚丙烯酸系分散剂作为分散剂。  The first liquid preferably contains a polyacrylic acid-based dispersant as a dispersant. 这种情况下，能够进一步提高氧化硅膜和氮化硅膜相对于多晶硅膜的研磨速度。 In this case, it is possible to further improve the silicon oxide film and a silicon nitride film polishing rate relative to the polysilicon film. 此外，本发明提供一种CMP研磨液，其含有铈系研磨粒、分散剂、聚丙烯酸化合物、 表面活性剂、pH调整剂、磷酸或磷酸衍生物中的至少一方的磷酸化合物和水，磷酸化合物的含量在以CMP研磨液总质量为基准时为0. 0Γ1. 0质量％。  Further, the present invention provides a CMP polishing liquid comprising a cerium-based abrasive grains, a dispersing agent, polyacrylic acid compound, a surfactant, pH adjusting agents, phosphoric acid derivatives, or at least one phosphoric acid compound and water , when the content of the phosphoric acid compound to the total mass of the CMP polishing liquid for the reference 0. 0Γ1. 0% by mass. 本发明的CMP研磨液可以含有pKa为8以上的碱性化合物作为pH调整剂。 CMP polishing liquid  the present invention may contain a pKa of 8 or more a basic compound as a pH adjusting agent. 本发明的CMP研磨液优选含有非离子性表面活性剂作为表面活性剂。  Surfactant CMP polishing liquid according to the present invention preferably contains a nonionic surfactant as. 这种情况下，能够进一步提高氧化硅膜和氮化硅膜相对于多晶硅膜的研磨速度。 In this case, it is possible to further improve the silicon oxide film and a silicon nitride film polishing rate relative to the polysilicon film. 本发明的CMP研磨液优选含有氧化铈粒子作为铈系研磨粒。 CMP polishing liquid is preferably  the present invention contains cerium cerium oxide particles as abrasive grain. 此外，本发明的CMP 研磨液优选含有氧化铺粒子作为铺系研磨粒，铺系研磨粒的平均粒径为〇. 〇1~2. 0 μ m。 Further, the CMP polishing liquid according to the present invention preferably contains oxide particles as laid shop based abrasive grains, the average particle diameter is plated square-based abrasive grains. 〇1 ~ 2. 0 μ m.
 本发明的CMP研磨液优选含有聚丙烯酸系分散剂作为分散剂。 CMP polishing liquid is preferably  the present invention contains a polyacrylic acid-based dispersant as a dispersant. 这种情况下，能够进一步提高氧化硅膜和氮化硅膜相对于多晶硅膜的研磨速度。 In this case, it is possible to further improve the silicon oxide film and a silicon nitride film polishing rate relative to the polysilicon film. 本发明提供一种基板研磨方法，其具备如下研磨工序：在将至少一个面上形成有被研磨膜的基板的该被研磨膜按压在研磨平台的研磨布上的状态下，一边将上述CMP研磨液供给到被研磨膜和研磨布之间，一边使基板和研磨平台相对移动，从而对被研磨膜进行研磨。  The present invention provides a method of polishing a substrate, comprising polishing the following steps of: at least one surface of a substrate to be polished is formed with a film under the film to be polished is pressed against the polishing cloth of the polishing platen state, while the the above-described CMP polishing liquid is supplied between the film to be polished and the polishing cloth while polishing the substrate and the platform relative movement, thereby polishing film to be polished. 此外，本发明提供一种基板研磨方法，其具备研磨液制备工序：将含有铈系研磨粒、分散剂和水的第1液与含有聚丙烯酸化合物、表面活性剂、pH调整剂、磷酸或磷酸衍生物中的至少一方的磷酸化合物和水且pH为6. 5以上的第2液混合，获得磷酸化合物的含量在以CMP研磨液总质量为基准时为0. 0Γ1. 0质量％的CMP研磨液；和研磨工序：使用CMP 研磨液，对在至少一个面上形成有被研磨膜的基板的该被研磨膜进行研磨。  Further, the present invention provides a method of polishing a substrate, comprising step of preparing polishing liquid: containing a cerium-based abrasive grains, dispersant, and water containing a first liquid and a polyacrylic acid compound, a surfactant, pH adjusting agent, phosphoric acid derivatives, or at least one phosphoric acid compound and water and having a pH of less than 6.5 second liquid mixture, obtained when the content of the phosphate compound to the total mass of the CMP polishing liquid for the reference 0. 0Γ1. 0% by mass the CMP polishing liquid; and polishing steps of: using the CMP polishing liquid for the film to be polished with a film to be polished formed of a substrate at least one surface is polished. 本发明的基板研磨方法能够提高氧化硅膜和氮化硅膜相对于多晶硅膜的研磨速度，能够应用于以多晶硅膜为截止膜对氧化硅膜、氮化硅膜进行研磨的研磨工序。  The method of polishing a substrate according to the present invention can improve silicon oxide film and a silicon nitride film with respect to the polishing rate of the polysilicon film, the polysilicon film can be applied to a polishing step of polishing a silicon oxide film, a silicon nitride film is a cutoff membrane . 在本发明的基板研磨方法中，优选第1液的pH为7. 0以上。  In the substrate polishing method according to the present invention, pH of the first liquid is preferably 7.0 or more. 在本发明的基板研磨方法中，基板的上述一个面可以具有高度差。 In the substrate polishing method according to the present invention, the one surface of the substrate may have a height difference. 在本发明的基板研磨方法中，基板和被研磨膜之间形成有多晶硅膜，在研磨工序中，可以以多晶硅膜作为截止膜而对被研磨膜进行研磨。 In the substrate polishing method according to the present invention, the polysilicon film is formed between the substrate and the film to be polished, the polishing step, the polysilicon film may be cut as a film of polishing film to be polished. 进而，在本发明的基板研磨方法中，可以在基板上形成有氧化硅膜或氮化硅膜中的至少一方作为被研磨膜。 Further, the method of polishing a substrate according to the present invention, the substrate may be formed on a silicon oxide film or silicon nitride film at least one of a film to be polished. 本发明提供一种具备通过上述基板研磨方法进行研磨而成的基板的电子部件。  The present invention provides an electronic component comprising a substrate obtained by polishing by the substrate polishing method. 这样的本发明的电子部件由于具备能够提高氧化硅膜和氮化硅膜相对于多晶硅膜的研磨速度的基板，从而具有能够应对加工的微细化的优异品质。 Such an electronic component according to the present invention includes the silicon oxide film can be improved relative to the substrate and a silicon nitride film polishing rate for a polysilicon film, and thus can cope with fine processing of excellent quality. 本发明的CMP研磨液和使用了该CMP研磨液的基板研磨方法能够抑制多晶硅膜的研磨速度且以充分实用的速度研磨氧化硅膜和氮化硅膜，能够应用于以多晶硅膜作为截止膜对氧化硅膜、氮化硅膜进行研磨的研磨工序。  CMP polishing liquid and a polishing liquid used in the CMP method of polishing a substrate according to the present invention can suppress the polishing rate of the polysilicon film and at a sufficiently practical speed polishing a silicon oxide film and a silicon nitride film, can be applied to a polycrystalline silicon film as a cutoff membrane on a silicon oxide film, a silicon nitride film polishing step of polishing. 此外，具备通过本发明的研磨方法进行研磨而成的基板的电子部件具有能够应对加工的微细化的优异品质。 In addition, an electronic component comprising a substrate having a finely ground can cope with fine processing of excellent quality by the polishing method of the present invention. 图1是表示本发明的一个实施方式的研磨方法的模式剖面图。  FIG. 1 is a schematic sectional view showing a polishing method according to an embodiment of the present invention. 图2是表示实施例中使用的图形晶片（パ夕一二，、）的模式剖面图。  FIG. 2 is a graph used in the wafer (pa twelve ,, Xi) is a schematic sectional view Fig. 本实施方式的CMP研磨液含有铈系研磨粒、分散剂、聚丙烯酸化合物、表面活性剂、pH调整剂、磷酸或磷酸衍生物中的至少一方的磷酸化合物、和水。  CMP polishing liquid according to the present embodiment includes a cerium-based abrasive grains, a dispersing agent, polyacrylic acid compound, a surfactant, pH adjusting agents, phosphoric acid derivatives, or at least one phosphoric acid compound, and water. 本实施方式的CMP研磨液可以将浆料（第1液）和添加液（第2液）混合而获得。 CMP polishing liquid according to the present embodiment may be a slurry (the first liquid) was added and the solution (second liquid) obtained by mixing. 首先对浆料进行说明。  First the slurry will be described. 浆料含有铈系研磨粒、分散剂和水。 Cerium slurry containing abrasive grains, a dispersing agent, and water. 就浆料而言，优选铈系研磨粒粒子通过分散剂而分散于水中。 On slurry, the cerium-based abrasive granulated particles preferably dispersed in water by a dispersant. 铈系研磨粒定义为含有铈作为构成元素的研磨粒。  The cerium-based abrasive grains is defined as the abrasive grains containing cerium as a constituent element. 本实施方式的CMP研磨液优选含有选自氧化铈、氢氧化铈、硝酸铵铈、醋酸铈、硫酸铈水合物、溴酸铈、溴化铈、氯化铈、草酸铈、硝酸铈和碳酸铈中的至少1种研磨粒作为铈系研磨粒，更优选含有氧化铈粒子，进一步优选由氧化铈粒子构成。 Embodiment of the present embodiment comprises the CMP polishing liquid is preferably selected from cerium oxide, cerium hydroxide, cerium nitrate, cerium acetate, cerium sulfate hydrate, cerium bromate, cerium bromide, cerium chloride, cerium oxalate, cerium nitrate and cerium carbonate at least one kind of the abrasive grains cerium-based abrasive grains, cerium oxide particles and more preferably comprises, more preferably consists of cerium oxide particles. 作为制造氧化铈粒子的方法没有特别限制，例如，可以使用烧成或利用过氧化氢等的氧化法。 It is not particularly limited in method for producing cerium oxide particles, e.g., calcination or may be used such as hydrogen peroxide oxidation. 氧化铈粒子例如可以通过对碳酸盐、硝酸盐、硫酸盐、草酸盐等铈化合物进行氧化而获得。 Cerium oxide particles can be obtained by, for example, carbonate, nitrate, sulfate, oxalate, cerium oxide compound. 前述烧成的温度优选35(T900°C。 The calcination temperature is preferably 35 (T900 ° C.
 铈系研磨粒优选含有具有晶界的多晶体铈系研磨粒。  The abrasive grains preferably contains a cerium-based abrasive grain having a cerium polycrystalline grain boundaries. 这样的多晶体的铈系研磨粒当在研磨中变细时同时逐渐出现活性面，因此能够高度地维持对氧化硅膜的高研磨速度。 Such a cerium-based polycrystalline abrasive grains in the polishing when the activity occurs while gradually tapered surface, it is possible to highly maintain high polishing rate of the silicon oxide film. 铈系研磨粒的微晶直径优选为广400nm。  The cerium-based abrasive grain crystallite diameter is preferably wide 400nm. 微晶直径可以通过TEM照片图像或SEM 图像而测定。 Crystallite diameter can be determined by TEM or SEM image photograph image. 就通过TE0S-CVD法等形成的氧化硅膜的研磨中所使用的氧化铈浆料（以下也简称为"浆料"。）而言，氧化铈粒子的微晶直径越大、晶体应变（Crystal strain)越少，即结晶性越好，则越能够高速研磨。 It is polished by the cerium oxide slurry of the silicon oxide film TE0S-CVD method, etc. As used (hereinafter, simply referred to as "slurry. "), The larger the crystallite diameter of cerium oxide particles, the strain crystals (Crystal Strain) the less, i.e., has better crystallizability, the more high speed grinding. 予以说明，微晶直径是指铈系研磨粒的一粒单晶的大小， 在为具有晶界的多晶体的情况下，是指构成多晶体的一粒粒子的大小。 Incidentally, the crystallite diameter is the size of a single crystal of a cerium-based abrasive grains, at polycrystalline grain boundaries having a case, it refers to the size of particles constituting a polycrystal. 铈系研磨粒发生聚集的情况下，优选进行机械粉碎。 In the case  The cerium aggregation of abrasive grains is preferably pulverized mechanically. 作为粉碎方法例如优选利用了喷射磨等的干式粉碎、利用了行星式珠磨等的湿式粉碎。 As the pulverization method, for example, preferably a dry pulverization using a jet mill or the like, using a planetary bead mill or the like of the wet-milling. 作为喷射磨，可以使用例如"化学工学論文集"，第6卷第5号，（1980)，527飞32页说明的喷射磨。 As a jet mill, may be used, for example, "Chemical Engineering Proceedings", Vol. 6, No. 5, (1980), 527 described flying jet mill 32. 将这样的铈系研磨粒分散于作为分散介质的水中而获得浆料。  Such a cerium-based abrasive grains dispersed in water as a dispersion medium to obtain a slurry. 作为分散方法，使用后述的分散剂，除了通过例如通常的搅拌机进行分散处理外，还可以使用均化器、超声波分散机、湿式球磨等。 For dispersion, a dispersant described below is used, for example, in addition to dispersion treatment by an ordinary stirrer, but may also be used a homogenizer, ultrasonic disperser, wet ball milling. 作为将通过上述方法分散后的铈系研磨粒进一步微粒化的方法，例如，可以使用如下的沉降分级法，即通过小型离心分离机对浆料进行离心分离后进行强制沉降，仅取出上清液。  As will be further atomized by the cerium-based abrasive grain dispersion method after the above methods, for example, may be used as a sedimentation classification method, i.e., the slurry is forced through a small centrifugal separation after sedimentation centrifuge, extracting only supernatant. 此外，作为微粒化方法，也可以使用在高压下使分散介质中的铈系研磨粒彼此碰撞的高压均化器。 Further, as the method of atomization, it may be used to make a cerium-based abrasive particles in the dispersion medium collide with each other the high pressure homogenizer under high pressure. 楽料中的铺系研磨粒的平均粒径优选0· 01~2· 0 μ m，更优选0· 08~0· 5 μ m，进一步优选0. 08~0. 4 μ m。 The average particle diameter of abrasive grains laid lines  yue compound is preferably 0 · 01 ~ 2 · 0 μ m, and more preferably from 0 · 08 ~ 0 · 5 μ m, more preferably 0. 08 ~ 0. 4 μ m. 此外，优选本实施方式的CMP研磨液含有氧化铈粒子且铈系研磨粒的平均粒径为0. 〇1~2. 0 μ m。 In addition, CMP polishing liquid according to the present preferred embodiment includes cerium oxide particles having an average particle diameter of the cerium-based abrasive grains 〇1 0. ~ 2. 0 μ m. 平均粒径为0. 01 μ m以上时，能够进一步提高氧化硅膜和氮化硅膜的研磨速度。 The average particle diameter is more than 0. 01 μ m, can further improve the polishing rate of silicon oxide film and a silicon nitride film. 平均粒径为2. 0 μ m以下时，能够抑制对被研磨膜带来研磨损伤。 When the average particle diameter of 2. 0 μ m or less, can be suppressed to bring the film to be polished polishing scratches. 铈系研磨粒的平均粒径是指通过激光衍射式粒度分布仪测定的体积分布的中值粒径。  The average particle diameter of the cerium-based abrasive grains means the volume distribution profile as measured using the median diameter by a laser diffraction particle size. 更具体而言，这样的平均粒径可以使用株式会社堀场制作所制的LA-920(商品名） 等而获得。 More specifically, this average particle size can be obtained using LA-920 (trade name) Horiba Seisakusho. 首先，以使测定时对于He-Ne激光的透过率（H)达到6(Γ70%的方式，对含有铈系研磨粒的样品（可以是浆料或CMP研磨液）进行稀释或浓缩，获得测定用样品。然后，将该测定样品加入到LA-920中进行测定，求出获得的算术平均直径（mean size，平均尺寸）。 First, in order for the measurement of the He-Ne laser transmittance (H) to reach 6 (Γ70% manner, a sample containing a cerium-based abrasive grains (which may be a slurry or CMP polishing liquid) diluted or concentrated to obtain the measurement sample. then, the measurement sample is added to the LA-920, was measured and the arithmetic mean diameter (mean size, average size) obtained. 铈系研磨粒的含量在以CMP研磨液总质量为基准时优选0. 2~3. 0质量％，更优选0. 3~2. 0质量％，进一步优选0. 5~1. 5质量％。  The content of the cerium-based abrasive grains 0.2 ~ 3.0% by mass when the total mass of the CMP polishing liquid is preferably a reference, and more preferably 0.3 ~ 2.0% by mass, more preferably 0.5 to 1. 5% by mass. 铈系研磨粒的含量为3. 0质量％以下时，能够进一步提高添加液所带来的研磨速度调整效果。 When the content of the cerium-based abrasive grains is 3.0 mass% or less, it can be added to further improve the polishing rate was brought adjustment effect. 此外，铈系研磨粒的含量为〇. 2质量％以上时，氧化硅膜的研磨速度能够进一步提高，能够容易获得希望的研磨速度。 Further, the content of the cerium-based abrasive grain is square when more than 2% by mass, the polishing rate of the silicon oxide film can be further improved, can be easily obtained a desired polishing rate. 就本实施方式的CMP研磨液中使用的分散剂而言，只要是能够溶解于水、能够使前述铈系研磨粒分散的化合物，就除此以外没有其它限制。  The CMP polishing liquid to the dispersing agent according to the present embodiment is used, as long as the compound is soluble in water, it is possible to make the dispersion of the abrasive grains cerium, except that no other restrictions on. 作为分散剂，通常优选对水的溶解度达到〇. 1~99. 9质量％的化合物，可以列举出例如水溶性阴离子性分散剂、水溶性非离子性分散剂、水溶性阳离子性分散剂、水溶性两性分散剂等，优选后述的聚羧酸型高分子分散剂。 As the dispersant, it is generally preferred to achieve a solubility in water of the square. 1 to 99.9% by mass of the compound, for example, include water-soluble anionic dispersant, a water-soluble nonionic dispersant, a water-soluble cationic dispersant, water-soluble amphipathic dispersing agents, polycarboxylic acid type polymer dispersant described later is preferred. 作为前述的水溶性阴离子性分散剂，可以列举出例如月桂基硫酸三乙醇胺、月桂基硫酸铵、聚氧乙烯烷基醚硫酸三乙醇胺、聚羧酸型高分子分散剂等。  As the water-soluble anionic dispersants may include, for example, triethanolamine lauryl sulfate, monoethanolamine lauryl sulfate, polyoxyethylene alkyl ether sulfuric acid triethanol amine, polycarboxylic acid type polymer dispersant. 作为前述的聚羧酸型高分子分散剂，可以列举出例如丙烯酸、甲基丙烯酸、马来酸、富马酸、衣康酸等具有不饱和双键的羧酸单体的聚合物、具有不饱和双键的羧酸单体和其它具有不饱和双键的单体的共聚物以及它们的铵盐、胺盐等。  As the polycarboxylic acid type polymer dispersant foregoing, may include, for example, acrylic acid, methacrylic acid, maleic acid, fumaric acid, itaconic acid polymer having an unsaturated double bond of carboxylic acid monomer , carboxylic acids having an unsaturated double bond and a monomer having an unsaturated double bond other copolymers of the monomers and their ammonium salts, amine salts and the like. 作为聚羧酸型高分子分散齐U，优选聚丙烯酸系分散剂，更优选以作为共聚成分的丙烯酸铵盐作为构成单元的高分子分散剂。 As the polycarboxylic acid type polymer dispersant homogeneous U, preferably a polyacrylic acid dispersant, more preferably ammonium acrylate as a copolymerizable component as a constituent unit of the polymer dispersant. 作为前述的以作为共聚成分的丙烯酸铵盐作为构成单元的高分子分散剂，可以优选使用例如聚丙烯酸铵盐、丙烯酸烷基酯与丙烯酸的共聚物的铵盐等。  Examples of the copolymerization component of the acrylic acid as ammonium salt as a dispersant composed of a polymer unit, can be preferably used, for example, ammonium polyacrylate, copolymers of alkyl acrylates and acrylic acid ammonium salt. 此外，还可以形成包含以作为共聚成分的丙烯酸铵盐作为构成单元的高分子分散剂中的至少1种和选自其它分散剂中的至少1种的2种以上的分散剂而使用。 In addition, can also form contains ammonium acrylate as a copolymerization component as at least one and more kinds of dispersants selected from other dispersant at least one kind of the polymer dispersant used in the constituent units. 聚羧酸型高分子分散剂的重均分子量优选为100000以下。  The polylactic acid type polymer dispersant average molecular weight of preferably 100,000 or less. 予以说明，重均分子量例如可以在以下条件下使用GPC进行测定。 It should be noted, for example, weight average molecular weight measured by GPC under the following conditions. 检测器：株式会社日立制作所公司制，RI-监视器，商品名"L-3000"  Detector: manufactured by Hitachi, Ltd., RI-monitor, trade name "L-3000"
 积分器：株式会社日立制作所公司制，GPC积分器，商品名"D-2200"  Integrator: manufactured by Hitachi, Ltd., GPC integrator, trade name "D-2200"
 泵：株式会社日立制作所公司制，商品名"L-6000"  Pump: Hitachi, Ltd., trade name "L-6000"
 脱气装置：昭和电工株式会社制，商品名"Shodex DEGAS"  degassing apparatus: manufactured by Showa Denko KK, trade name "Shodex DEGAS"
 作为前述的水溶性非离子性分散剂，可以列举出例如聚氧乙烯月桂基醚、聚氧乙烯鲸蜡基醚、聚氧乙烯硬脂基醚、聚氧乙烯油基醚、聚氧乙烯高级醇醚、聚氧乙烯辛基苯基醚、聚氧乙烯壬基苯基醚、聚氧亚烷基烷基醚、聚氧乙烯衍生物、聚氧乙烯山梨糖醇酐单月桂酸酯、聚氧乙烯山梨糖醇酐单棕榈酸酯、聚氧乙烯山梨糖醇酐单硬脂酸酯、聚氧乙烯山梨糖醇酐三硬脂酸酯、聚氧乙烯山梨糖醇酐单油酸酯、聚氧乙烯山梨糖醇酐三油酸酯、四油酸聚氧乙烯山梨糖醇、聚乙二醇单月桂酸酯、聚乙二醇单硬脂酸酯、聚乙二醇二硬脂酸酯、聚乙二醇单油酸酯、聚氧乙烯烷基胺、聚氧乙烯氢化蓖麻油、甲基丙烯酸-2-羟乙酯、烷基烷醇酰胺等。  The water-soluble nonionic dispersants of the foregoing, may include such as polyoxyethylene lauryl ether, polyoxyethylene cetyl ether, polyoxyethylene stearyl ether, polyoxyethylene oleyl ether, polyoxyethylene polyoxyethylene higher alcohol ether, polyoxyethylene octylphenyl ether, polyoxyethylene nonylphenyl ether, polyoxyethylene alkyl ether, polyoxyethylene derivatives, polyoxyethylene sorbitan monolaurate, polyoxyethylene sorbitan monopalmitate, polyoxyethylene sorbitan monostearate, polyoxyethylene sorbitan tristearate, polyoxyethylene sorbitan monooleate, polyoxyethylene sorbitan trioleate, tetraoleate polyoxyethylene sorbitol, polyethylene glycol monolaurate, polyethylene glycol monostearate, polyethylene glycol distearate , polyethylene glycol monooleate, polyoxyethylene alkylamine, polyoxyethylene hydrogenated castor oil, methyl acrylate, 2-hydroxyethyl methacrylate, an alkyl alkanolamide. 作为前述的水溶性阳离子性分散剂，可以列举出例如聚乙烯吡咯烷酮、椰油胺醋酸酯、硬脂酰胺醋酸酯等。  As the water-soluble cationic dispersant, and may include, for example, polyvinylpyrrolidone, coconut amine acetate, stearylamine acetate and the like. 作为水溶性两性分散剂，可以列举出例如月桂基甜菜碱、硬脂基甜菜碱、月桂基二甲基氧化胺、2-烷基-N-羧甲基-N-羟乙基咪唑鎗甜菜碱等。  The water-soluble amphoteric dispersant may include, for example, lauryl betaine, stearyl betaine, lauryl dimethyl amine oxide, 2-alkyl hydroxyethyl imidazoline -N- carboxymethyl -N- gun betaine. 前述的各种分散剂可以单独使用或将2种以上组合使用。  The aforementioned various dispersants may be used alone or in combination of two or more kinds. 予以说明，将浆料和添加液混合而得的CMP研磨液，可以使用与后述的聚丙烯酸化合物、表面活性剂同样的物质作为分散剂。 Incidentally, the mixed solution was added and the slurry obtained by CMP polishing liquid, polyacrylic acid compound can be described later, the same substance surfactant as a dispersant. 这种情况下，将浆料和添加液混合而得的CMP研磨液含有来源于浆料的物质和来源于添加液的物质。 In this case, the mixed solution was added and the slurry obtained by CMP polishing liquid containing a substance derived from a slurry of material and liquid added. 从能够充分分散研磨粒、能够抑制保管中的聚集沉降的观点出发，浆料中的分散剂的含量在以浆料中的研磨粒的总质量为基准时优选1. (Γ5. 0质量％，更优选1. (Γ4. 0质量％。  From the viewpoint of sufficiently dispersing abrasive grains, the storage can be suppressed aggregation sedimentation of the slurry content of the dispersant in the total mass of the abrasive grains in the slurry as a reference is preferably 1. (Γ5. 0 mass%, and more preferably 1. (Γ4. 0% by mass. 在与半导体元件的制造相关的研磨中使用CMP研磨液的情况下，例如，在以CMP研磨液全体为基准时，优选将全部分散剂中的杂质离子（钠离子、钾离子等碱金属、卤素原子和硫原子等）的含有率以质量比计抑制在lOppm以下。  The case of using a CMP polishing liquid in the polishing associated with manufacturing a semiconductor device, for example, when the CMP polishing liquid whole is preferably no impurity ions all dispersant (sodium ion, potassium ion, alkali content of the metal, a halogen atom and a sulfur atom, etc.) in a mass ratio suppressed lOppm or less. 浆料的pH优选为7.0以上，更优选7. (Γ12.0,进一步优选7. (Til. 0。当pH为7.0 以上时，能够抑制粒子聚集。当pH为12.0以下时，能够获得良好的平坦性。  The pH of the slurry is preferably 7.0 or more, and more preferably 7. (Γ12.0, more preferably 7. (Til. 0. When the pH is 7.0 or more, particle aggregation can be suppressed. When the pH is 12.0 or less, good flatness. 本实施方式的CMP研磨液中，对浆料、添加液或它们的浓缩液的稀释中使用的介质即水没有特别限制，优选去离子水、超纯水。  CMP polishing liquid according to the present embodiment, the slurry, solution or medium is added to dilute the concentrate thereof, i.e., the water used is not particularly limited, and preferably deionized water, ultra pure water. 水的含量为其它含有成分含量的剩余部分即可，没有特别限制。 The water content of the remaining portion can contain other component content is not particularly limited. 下面对添加液进行说明。  Next, the liquid additive will be described. 添加液含有聚丙烯酸化合物、表面活性剂、pH调整剂、磷酸或磷酸衍生物中的至少一方的磷酸化合物、和水。 Add solution containing polyacrylic acid compounds, surfactants, pH adjusting agents, phosphoric acid derivatives, or at least one phosphoric acid compound, and water. 添加液含有聚丙烯酸化合物作为添加液成分的1种成分。  Add solution containing polyacrylic acid compound is added as one component of the fluid composition. 作为聚丙烯酸化合物， 可以列举出由丙烯酸均聚物形成的聚丙烯酸、丙烯酸和水溶性的丙烯酸烷基酯的共聚物。 As the polyacrylic acid compound, a copolymer of polyacrylic acid include a homopolymer of acrylic acid, acrylic acid and water-soluble acrylic acid alkyl ester. 作为聚丙烯酸化合物，可以使用例如聚丙烯酸、丙烯酸和丙烯酸甲酯的共聚物、丙烯酸和甲基丙烯酸的共聚物、丙烯酸和丙烯酸乙酯的共聚物等，其中优选使用聚丙烯酸。 As the polyacrylic acid compound, a copolymer may be used copolymers of polyacrylic acid, acrylic acid and methyl acrylate, acrylic acid and methacrylic acid, acrylic acid and ethyl acrylate, for example, a polyacrylic acid is preferably used. 这些可以单独使用或将2种以上组合使用。 These may be used singly or in combination of two or more kinds. 聚丙烯酸化合物的重均分子量优选为500000以下，更优选为50000以下。 Weight  average molecular weight of the polyacrylic acid compound is preferably 500,000 or less, more preferably 50,000 or less. 当重均分子量为500000以下时，例如使用聚丙烯酸时，聚丙烯酸易于均匀地吸附在被研磨膜上。 When the weight average molecular weight is 500,000 or less, for example, polyacrylic acid, polyacrylic acid readily adsorbed uniformly polished film. 予以说明，重均分子量可以在与聚羧酸型高分子分散剂同样的条件下使用GPC进行测定。 Incidentally, GPC weight average molecular weight may be used in the polycarboxylic acid type polymer dispersant was measured under the same conditions. 聚丙烯酸化合物的含量在以CMP研磨液总质量为基准时优选0. 05~2. 0质量％，更优选0. 08~1. 8质量％，进一步优选0. l(Tl. 5质量％。当聚丙烯酸化合物的含量为2. 0质量％ 以下时，能够进一步提高氧化硅膜的研磨速度。当聚丙烯酸化合物的含量为〇. 05质量％以上时，能够提高平坦性。予以说明，使用聚丙烯酸化合物作为前述分散剂时，优选作为分散剂的聚丙烯酸化合物和添加液中的聚丙烯酸化合物的合计量满足上述范围。  The content of the polyacrylic acid compound is 0.05 ~ 2.0% by mass when the total mass of the CMP polishing liquid is preferably a reference, and more preferably 0.08 - 1.8% by mass, more preferably 0. l (Tl. 5 mass%. when the content of the polyacrylic acid compound is 2.0 mass% or less, it is possible to further improve the polishing rate of the silicon oxide film. when the content of the polyacrylic acid compound as a square 05 mass% or more, the flatness can be improved. Incidentally when polyacrylic acid compound as the dispersing agent, polyacrylic acid compound and the total amount of polyacrylic acid compound solution is preferably added as a dispersing agent satisfies the above range. 添加液含有表面活性剂作为添加液成分的1种成分。  Add solution containing a surfactant added as one component of the fluid composition. 作为表面活性剂，可以列举出阴离子性表面活性剂、非离子性表面活性剂、阳离子性表面活性剂、两性离子性表面活性齐U。 As the surface active agent may include anionic surfactants, nonionic surfactants, cationic surfactants, zwitterionic surfactants together U. 这些可以单独使用或将2种以上组合使用。 These may be used singly or in combination of two or more kinds. 上述表面活性剂中，特别优选非离子性表面活性剂。 In the surfactant, particularly preferably a nonionic surfactant. 作为前述的非离子性表面活性剂，可以列举出例如聚氧丙烯、聚氧乙烯烷基醚、聚氧乙烯烷基烯丙基醚、聚氧乙烯聚氧丙烯醚衍生物、聚氧丙烯甘油基醚、聚乙二醇、甲氧基聚乙二醇、乙炔系二醇的环氧乙烷加成物等醚型表面活性剂、山梨糖醇酐脂肪酸酯、甘油硼酸酯脂肪酸酯等酯型表面活性剂、聚氧乙烯烷基胺等氨基醚型表面活性剂、聚氧乙烯山梨糖醇酐脂肪酸酯、聚氧乙烯甘油硼酸酯脂肪酸酯、聚氧乙烯烷基酯等醚酯型表面活性剂、月旨肪酸烷醇酰胺、聚氧乙烯脂肪酸烷醇酰胺等烷醇酰胺型表面活性剂、乙炔系二醇的环氧乙烷加成物、聚乙烯吡咯烷酮、聚丙烯酰胺、聚二甲基丙烯酰胺等。  Examples of the nonionic surfactant may include, for example, polyoxypropylene, polyoxyethylene alkyl ethers, polyoxyethylene alkyl allyl ether, polyoxyethylene polyoxypropylene ether derivative, polyoxypropylene ether type surface-propylene glyceryl ether, polyethylene glycol, methoxy polyethylene glycol, an acetylene-based diol ethylene oxide adducts of active agents, sorbitol, sorbitan fatty acid esters, glycerol fatty acid ester and ester type surfactants, polyoxyethylene alkylamine amino ether type surfactant, a polyoxyethylene sorbitan fatty acid esters, sorbitan, polyoxyethylene glycerol borate fatty acid esters, polyoxyethylene alkyl ester and ether ester type surfactants, fatty acid alkanolamides aimed month, polyoxyethylene fatty acid alkanolamide alkanolamide type surfactants, acetylene glycol-based ethylene oxide adduct, polyvinylpyrrolidone, polyacrylamide, polydimethyl acrylamide and the like. 表面活性剂的含量在以CMP研磨液总质量为基准时优选0. 0Γ1. 0质量％，更优选0. 02~0. 7质量％，进一步优选为0. 03~0. 5质量％。  The content of the surfactant is 0. 0Γ1. 0% by mass when the total mass of the CMP polishing liquid is preferably a reference, and more preferably 0.02 - 0.7% by mass, more preferably 0.03 ~ 0.5 mass %. 当表面活性剂的含量为1. 0质量％以下时，氧化硅膜的研磨速度进一步提高。 When the content of the surfactant is 1.0 mass% or less, the polishing rate of the silicon oxide film is further improved. 当表面活性剂的含量为0. 01质量％以上时，能够进一步抑制多晶硅膜研磨速度的增加。 When the content of the surfactant is less than 0.01% by mass, it is possible to further suppress an increase in polishing rate of the polysilicon film. 予以说明，使用表面活性剂作为前述分散剂的情况下， 优选作为分散剂的表面活性剂和添加液中的表面活性剂的合计量满足上述范围。 Incidentally, the case of using the surfactant as a dispersant, preferably as a dispersant of the total amount of surfactant solution added surfactant and satisfies the above range. 添加液的pH必须为6. 5以上，优选6. 7〜12.0,更优选为6. 8〜11.0。  The pH must be added is 6.5 or more, preferably 7~12.0 6, more preferably 6. 8~11.0. 当pH为6. 5 以上时，能够抑制将添加液和浆料混合时浆料中所含的粒子发生聚集。 When the pH is 6.5 or more, the particles can be suppressed when adding the liquid slurry and mixed slurry contained aggregation occurs. 当pH为12. 0以下时，在将添加液和浆料混合时能够获得良好的平坦性。 When the pH is 12.0 or less, when adding a liquid to obtain a slurry mixing and good flatness. 添加液的pH可以通过通常的使用玻璃电极的pH计进行测定。  pH of solution added can be measured by using a conventional glass electrode pH meter. 测定pH时，具体而言可以使用例如株式会社堀场制作所的商品名：Model (F-51)。 Measured pH, specifically, may be used, for example, the tradename of Horiba Seisakusho: Model (F-51). 添加液的pH可以如下获得， 艮P，使用邻苯二甲酸盐pH标准液（pH :4. 01)、中性磷酸盐pH标准液（pH :6. 86)和硼酸盐pH 标准液（pH :9. 18)作为pH标准液，对pH计进行3点校正后，将pH计的电极放入添加液中， 测定经过2分钟以上而稳定后的值，从而获得。 pH can be obtained by adding liquid, Gen P, using phthalate pH standard solution (pH:. 4 01), a neutral phosphate pH standard solution (pH:. 6 86) and borate pH standard solution (pH:. 9 18) after a pH standard solution for pH meter calibration at three points, the electrode pH meter into the solution was added, the measurement value is stabilized after 2 minutes or more to obtain. 此时，标准缓冲液和添加液的液温例如均可以设为25°C。 At this time, the liquid temperature and standard buffer solution is added, for example, can be set to 25 ° C. 予以说明，浆料的pH也可以通过同样的方法进行测定。 Incidentally, pH of the slurry may be measured by the same method. 本实施方式的CMP研磨液含有pH调整剂作为添加液成分的1种成分。  CMP polishing liquid according to the present embodiment contains pH adjusting agent is added as one component of the fluid composition. 作为pH调整剂，可以列举出水溶性的碱性化合物、水溶性的酸化合物。 As the pH adjusting agent include water-soluble acid compound is a basic compound, water-soluble. 作为碱性化合物，可以列举出pKa为8以上的碱性化合物。 The basic compound may include more than the basic compound having a pKa of 8. 这里，"pKa"是指能够解离的第1酸性基团(第1解離可能酸性基)的酸解离常数，为该基团的平衡常数Ka的负常用对数。 Here, "pKa" refers to an acidic group capable of dissociation (first acidic group may be dissociated) acid dissociation constant, the negative common logarithm of the equilibrium constant Ka for the group. 作为前述的碱性化合物，具体而言，优选使用水溶性的有机胺、氨水等。 Examples of the basic compound, particularly preferably a water-soluble organic amines and ammonia. 此外，添加液的pH还可以通过上述聚丙烯酸化合物等其它含有成分进行调整。 In addition, pH may also be added to adjust the liquid containing the component in the other by a polyacrylic acid compound. 作为水溶性的有机胺，可以列举出例如乙胺、二乙胺、三乙胺、二苯胍、哌啶、丁胺、 二丁胺、异丙胺、四甲基氢氧化铵、四甲基氯化铵、四甲基溴化铵、四甲基氟化铵、四丁基氢氧化铵、四丁基氯化铵、四丁基溴化铵、四丁基氟化铵、四甲基铵硝酸盐、四甲基铵醋酸盐、 四甲基铵丙酸盐、四甲基铵马来酸盐、四甲基铵硫酸盐等。  The water-soluble organic amine may include, for example, ethylamine, diethylamine, triethylamine, diphenyl guanidine, piperidine, butylamine, dibutylamine, diisopropylamine, tetramethylammonium hydroxide, tetra chloride, tetramethylammonium bromide, tetramethylammonium fluoride, tetrabutylammonium hydroxide, tetrabutylammonium chloride, tetrabutylammonium bromide, tetrabutylammonium fluoride, tetramethylammonium nitrate, tetramethylammonium acetate, tetramethylammonium propionate, tetramethylammonium maleate, tetramethylammonium sulfate. 就pH调整剂的含量而言，例如使用碱性化合物的情况下，在以CMP研磨液总质量为基准时，优选0. 01〜10. 0质量％，更优选0. 05〜5. 0质量％，进一步优选0. 1〜3. 0质量％。  In terms of the content of pH adjusting agent, for example, the case of using a basic compound, when the total mass of the CMP polishing liquid as a reference, preferably 01~10 0. 0% by mass, and more preferably 0. 05~5 0% by mass, more preferably 0.5 ~ 3. 0% by mass. 但是，pH调整剂的含量受调整的pH制约，因此取决于其它含有成分（强酸、聚丙烯酸化合物等）的含量，并没有特别限制。 However, the content of pH adjusting agent to adjust the pH by the constraints and therefore the content depending on the other ingredients comprising (a strong acid, polyacrylic acid compound and the like) is not particularly limited. 添加液含有磷酸或磷酸衍生物中的至少一方的磷酸化合物作为添加液成分的1 种成分。  adding phosphoric acid or phosphoric acid solution containing at least one derivative of the phosphoric acid compound is added as one component of the fluid composition. 予以说明，"磷酸化合物"指包括磷酸、磷酸衍生物在内的物质。 Incidentally, "phosphoric acid compound" refers to a substance comprising a phosphate, including derivatives. 作为磷酸衍生物， 可以列举出例如二聚体、三聚体等磷酸聚合物（例如焦磷酸、焦亚磷酸、三偏磷酸）、含有磷酸基的化合物（例如，磷酸氢钠、磷酸钠、磷酸铵、磷酸钾、磷酸钙、焦磷酸钠、聚磷酸、聚磷酸钠、偏磷酸、偏磷酸钠、磷酸铵等）。 Phosphoric acid derivatives, include, for example, dimers, trimers and other acid polymer (e.g., pyrophosphate, phosphite, trimetaphosphoric acid), phosphoric acid group-containing compound (e.g., sodium hydrogen phosphate, sodium phosphate, ammonium, potassium phosphate, calcium phosphate, sodium pyrophosphate, polyphosphoric acid, sodium polyphosphate, sodium metaphosphate, sodium metaphosphate, ammonium phosphate). 磷酸化合物的含量在以CMP研磨液总质量为基准时为O.Ofl.O质量％，优选0.02、. 7质量％，更优选0.03、. 5质量％。  content of the phosphate compound upon the total mass of the CMP polishing liquid O.Ofl.O reference mass%, preferably 0.02 ,. 7 mass%, and more preferably 0.03% by mass ,. 5. 当磷酸化合物的含量为1.0质量％以下时，能够进一步提高氮化硅膜的研磨速度。 When the content of the phosphate compound is 1.0% by mass or less, it is possible to further improve the polishing rate of the silicon nitride film. 同样，当磷酸化合物的含量为〇. 01质量％以上时，能够进一步提高氮化硅膜的研磨速度。 Also, when the content of phosphoric acid compound is square. 01 mass% or more, it is possible to further improve the polishing rate of the silicon nitride film. 予以说明，同时使用磷酸和磷酸衍生物作为磷酸化合物时，优选它们的合计量满足上述范围。 Incidentally, while the use of phosphoric acid and phosphoric acid derivatives as the compound, the total amount thereof preferably satisfies the above range. 就本实施方式的CMP研磨液而言，例如，优选以分成通过分散剂使铈系研磨粒分散于水中的浆料、和添加液的两液式研磨液的方式进行保存。  In terms of the CMP polishing liquid according to the present embodiment, for example, it is preferably divided into a cerium-based abrasive grains dispersed by a dispersant in the slurry in water, and two liquid-type manner polishing liquid additive liquid is stored. 不将浆料和添加剂混合而是以两液式研磨液的方式保管时，能够抑制铈系研磨粒聚集，抑制研磨损伤的效果和研磨速度发生改变。 The slurry without additives, but in a manner and two liquid type liquid storage polishing, abrasive grains can be suppressed cerium aggregation, the effect of suppressing the polishing rate and polishing scratches changed. 浆料和添加液既可以事前进行混合，也可以在即将使用前进行混合。  The slurry solution may be added and mixed beforehand, can also be mixed immediately before use. 使用两液式研磨液的情况下，例如可以使用：A方法，通过不同配管输送浆料和添加液，使这些配管汇合并在供给配管出口之前混合而供给到研磨平台上；B方法，在即将研磨前将浆料和添加液混合；C方法，分别将浆料和添加剂供给到研磨平台上，在研磨平台上将两液混合；和D方法，通过供给配管供给预先使浆料和添加液混合而成的液体；等。 The case where two liquid-type polishing liquid, for example, may be used: A method for transporting a slurry and adding liquid through different pipes, these pipes merge and is supplied to the grinding table mixed before supply pipe outlet; B method, in the forthcoming before grinding the slurry was mixed and added; C, were used to feed additives, the polishing slurry and the platform, on the two-liquid mixing in the polishing platen; and a method D, is supplied through the supply tube with pre-mixed solution was added and the slurry obtained by the liquid; and the like. 通过任意改变上述两液的配合，能够调整平坦化特性和研磨速度。 By fitting the above-described two liquid arbitrarily changed, it is possible to adjust the polishing rate and planarization characteristics. 浆料和添加液的配合比以质量比计优选1 :l(Tl〇: 1 (浆料：添加液）左右。在Α方法或Β方法的情况下，也可以将浆料、添加液预先制成减少了水的含量的浓缩液，在混合时根据需要用去离子水稀释。 And adding the liquid slurry with the mass ratio is preferably 1: L (Tl〇: 1 (paste: solution added) in a case where the left and right Α Β methods or method, the slurry may also be added to previously prepared solution to reduce the water content of the concentrate, diluted as needed with deionized water while mixing. 本实施方式的基板研磨方法具备如下研磨工序：在将至少一个面上形成有被研磨膜的基板的该被研磨膜按压在研磨平台的研磨布上的状态下，一边将前述CMP研磨液供给到被研磨膜和研磨布之间，一边使基板和研磨平台相对移动，从而对被研磨膜进行研磨。  The method of polishing a substrate according to the present embodiment includes a step of polishing the following: the platform is pressed against the polishing cloth of the polishing state in which the substrate is polished to be polished of the film membrane, while the CMP polishing the one surface is formed at least supplying liquid between the film to be polished and the polishing cloth while polishing the substrate and the platform relative movement, thereby polishing film to be polished. 此夕卜，本实施方式的基板研磨方法还可以具备研磨液制备工序：将浆料和添加液混合获得前述CMP研磨液；和研磨工序：使用获得的CMP研磨液，对在至少一个面上形成有被研磨膜的基板的该被研磨膜进行研磨。 Bu this evening, a substrate polishing method of this embodiment may further include a polishing liquid preparation step: added and the slurry was mixed to obtain the CMP polishing liquid; and a polishing step: using the obtained CMP polishing liquid, is formed on at least one face a substrate film to be polished of the polishing film to be polished. 本实施方式的基板研磨方法尤其适合于在基板的形成有被研磨膜的上述一个面具有高度差的情况下，对基板的该一个面进行研磨而将高度差平坦化的研磨工序。  a substrate polishing method of this embodiment is particularly suitable for forming the substrate has the one surface of the film to be polished having the height difference of the case, to the one surface of the substrate is polished while the height difference planarizing polishing process. 本实施方式的基板研磨方法中，在基板和被研磨膜之间形成有多晶硅膜的情况下，在研磨工序中可以以多晶硅膜作为截止膜对被研磨膜进行研磨。 The lower substrate polishing method  according to the present embodiment, the case has a polysilicon film formed between the substrate and the film to be polished, the polishing process may be a polysilicon film as a film off film to be polished is polished. 例如，可以在形成有分离槽的基板上沿着该分离槽形成截止膜，在截止膜上形成被研磨膜后，除去被研磨膜直至露出截止膜。 For example, there may be formed on the substrate cutoff membrane separation grooves along the separation grooves formed in the film forming film to be polished off, removed off the film until the film to be polished is exposed. 更具体而言，可以列举出对具有如图1的（a)所示的构造的基板100进行研磨的研磨方法。  More specifically, the method may include polishing a polishing substrate having a configuration as shown in FIG. 1 (a) is 100. 图1的（a)所示的基板100在硅1上形成的槽中埋入二氧化硅等绝缘物2而形成有浅沟槽隔离（STI)。 FIG. (A) of the substrate 100 shown in FIG. 1 formed on a silicon insulating material such as silicon dioxide buried tank 1, 2 are formed with a shallow trench isolation (STI). 具有高导电率的绝缘膜（High-k绝缘膜）3层叠在硅1之上。 An insulating film (High-k insulating film) 3 having a high conductivity is stacked on a silicon. 在绝缘膜3上的规定位置形成有多晶硅膜的虚拟栅（dummygateM，在该虚拟栅4的侧部形成有氮化硅膜的侧壁5。进而，为了对扩散层施加应力、提高晶体管性能，以覆盖表面的方式层叠氮化娃膜的应力膜（stress liner)6,最后层叠氧化娃膜7。通过使用本实施方式的CMP 研磨液，对这样的基板的前述氧化硅膜7和前述氮化硅的应力膜6的一部分进行研磨，直至前述多晶硅的虚拟栅4露出，能够获得如图1的（b)所示构造的基板200。该工序中，作为前述虚拟栅4的多晶硅膜作为用于抑制过度研磨的截止膜而起作用。 Predetermined position on the insulating film 3 is formed with a dummy gate polysilicon film (dummygateM, a silicon nitride film is formed at a side portion of the side wall of the dummy gate 4, 5. Further, stress is applied to the diffusion layer, to improve transistor performance, in the laminated film type stress nitride film covering the surface of the doll (stress liner) 6, 7. Finally, the laminated oxide film baby by using the CMP polishing liquid according to the present embodiment, the silicon oxide film on such a substrate and the nitride 7 part of the stress silicon film 6 is polished until the polysilicon dummy gate 4 are exposed, can be obtained as shown in (b), the configuration of the substrate 200. in this step, as the dummy gate polysilicon film 4 as a 1 suppressing excessive polishing cutoff membrane to function. 以下，列举形成有氧化硅膜或氮化硅膜中的至少一方的无机绝缘层作为被研磨膜的半导体基板的例子，对研磨方法进一步进行说明。  Here, an example silicon oxide or silicon nitride film at least one of an inorganic insulating layer as the semiconductor substrate to be polished include film formation, the polishing method will be further described. 作为本实施方式的研磨方法中使用的研磨装置，可以使用例如具有：保持具有被研磨膜的基板的固定器、能够贴合研磨布（衬垫）且安装有转速可变的电动机等的研磨平台的常规研磨装置等。  polishing apparatus used in the polishing method of this embodiment can be used, for example, comprises: a holding fixture having a film to be polished substrate can be bonded to the polishing cloth (pad), and variable rotational speed of the motor and the like mounted conventional grinding apparatus and the like of the grinding table. 作为上述研磨装置，可以列举出例如株式会社荏原制作所制的研磨装置，型号： EP0-111，AMAT(Applied Materials)公司制的研磨装置，商品名：Mirra3400、Reflection 研磨机，等。  As the polishing apparatus, the polishing apparatus may include, for example, manufactured by Ebara Corporation, model: EP0-111, polishing apparatus AMAT (Applied Materials) Corporation, trade name: Mirra3400, Reflection mill, and the like. 作为研磨布没有特别限制，可以使用例如通常的无纺布、发泡聚氨酯、多孔质氟树脂等。  As the polishing cloth is not particularly limited, and may be used, for example, a general nonwoven fabric, foamed polyurethane, porous fluorine resin and the like. 此外，前述研磨布优选实施开槽加工，以留存研磨液。 Further, the polishing cloth grooving preferred embodiment, in order to retain the polishing solution. 作为研磨条件没有特别限制，从抑制半导体基板脱出的立场出发，优选研磨平台的旋转速度为200rpm以下的低旋转。  The polishing conditions are not particularly limited, and inhibiting the semiconductor substrate from coming off position, the rotational speed of the polishing platen is preferably a low rotational 200rpm or less. 从抑制研磨后发生损伤的立场出发，施加于半导体基板的压力（加工负荷）优选l〇〇kPa以下。 From the standpoint of suppressing damage occurs after grinding, the pressure applied to the semiconductor substrate (processing load) is preferably less l〇〇kPa. 优选在研磨期间用泵等连续地将研磨液供给到研磨布的表面。  Preferably a pump or the like during polishing the polishing liquid is continuously supplied to the surface of the polishing cloth. 其供给量没有限制，优选研磨布的表面一直被研磨液覆盖。 Supply amount thereof is not limited, preferably the surface of the polishing cloth has been covered with the polishing liquid. 如前所述，研磨液的供给方法可以列举出：A方法，通过不同配管输送两液，使这些配管汇合并在供给配管出口之前混合而供给到研磨平台上；B方法，在即将研磨前将两液混合；C方法，分别将两液供给到研磨平台上；和D方法，通过供给配管供给预先使浆料和添加液混合而成的液体；等。  As described above, the supply method of polishing liquid may include: A method of conveying two liquid through different pipes, these pipes merge and is supplied to the grinding table mixed before supply pipe outlet; B method, in the forthcoming the two-liquid mixture before milling; C, were used two liquid supplied onto the polishing platen; and a method D, is supplied through the supply tube with pre-added and the slurry was obtained by mixing a liquid; and the like. 研磨结束后的半导体基板优选在流水中充分清洗后使用旋转干燥器等使附着于半导体基板上的水滴脱离然后使之干燥。  After polishing of the semiconductor substrate after the completion of preferably sufficiently washed with running water using a rotary dryer or the like so that the water droplets adhere to the semiconductor substrate is then allowed to dry out. 这样，通过上述研磨液对作为被研磨膜的无机绝缘层进行研磨，能够消除表面的凹凸，能够在半导体基板整个表面获得平滑的面。 Thus, the polishing liquid through a film to be polished on the inorganic insulating layer is polished, the surface irregularities can be eliminated, it is possible to obtain a smooth surface over the entire surface of the semiconductor substrate. 通过将该工序重复规定次数，能够制造具有希望的层数的半导体基板。 By repeating the process a predetermined number of times, the semiconductor substrate can be produced having the desired number of layers. 作为制作被研磨膜即氧化硅膜和氮化硅膜的方法，可以列举出低压CVD法、等离子体CVD法等。  As a method for making the film, is polished silicon oxide film and a silicon nitride film, it can include a low pressure CVD method, a plasma CVD method or the like. 通过低压CVD法形成氧化硅膜时，作为Si源可以使用单硅烷：SiH 4，作为氧源可以使用氧气：〇2。 When a silicon oxide film is formed by low pressure CVD method, may be used as the Si source monosilane: SiH 4, oxygen as an oxygen source may be used: 〇2. 氧化硅膜可以通过在400°C以下的低温下进行该SiH 4-〇2系氧化反应而获得。 A silicon oxide film may be performed by the SiH 4-〇2 based oxidation reaction at low temperatures to 400 ° C is obtained. 通过CVD法制作氧化硅膜后，根据情况可以在1000°C或其以下的温度下进行热处理。 After the silicon oxide layer by a CVD method, a heat treatment may be performed at or below 1000 ° C temperature according to the situation. 氧化硅膜中可以掺杂磷、硼等元素。  the silicon oxide film may be doped with phosphorus, boron, and other elements. 为了谋求通过高温回流带来的表面平坦化，在氧化硅膜中掺杂磷：P时，优选使用SiH 4-〇2-PH3系反应气体。 In order to seek the surface caused by the high-temperature reflow planarization, phosphorus doped silicon oxide film: P, the reaction gas is preferably used SiH 4-〇2-PH3 system. 等离子体CVD法具有能够以低温来进行在通常的热平衡下需要高温的化学反应的优点。  a plasma CVD method at a low temperature has the advantage of being able to perform at a high temperature typically requires thermal equilibrium chemical reactions. 等离子体发生法可以列举出电容耦合(容量結合）型和感应耦合(誘導結合）型两者。 Plasma generating process may include both the capacitive coupling (capacitive coupling) type and an inductive coupling (induced binding) type. 作为反应气体，可以列举出使用SiH 4为Si源、使用N20为氧源的SiH4-N20系气体，在Si源中使用四乙氧基硅烷（TE0S)的TE0S-02系气体（TE0S-等离子体CVD法）。 The reaction gas may include the use of SiH 4 as an Si source, using SiH4-N20 N20-based gas as a source of oxygen, using tetraethoxysilane (TE0S) of TE0S-02-based gas (TE0S- Si in the plasma source CVD method). 基板温度优选在25(T400°C的范围，反应压力优选在67〜400Pa的范围。 Substrate temperature in the range of preferably 67~400Pa 25 (T400 ° C range, the reaction pressure is preferably. 利用低压CVD法形成氮化硅膜的情况下，可以使用二氯硅烷：SiH2Cl 2作为Si源， 使用氨：NH3作为氮源。 In the case  a silicon nitride film formed by a low pressure CVD method, dichlorosilane may be used: SiH2Cl 2 as a Si source, ammonia: NH3 as a nitrogen source. 氮化硅膜可以通过在900°C的高温下进行SiH 2Cl2-NH3系氧化反应而获得。 Silicon nitride film can be obtained based SiH 2Cl2-NH3 oxidation reaction at a high temperature of 900 ° C.
 作为等离子体CVD法的反应气体，可以列举出使用SiH4作为Si源、使用NH 3作为氮源的SiH4-NH3系气体。  As a reaction gas plasma CVD method may include using SiH4 as an Si source, using NH 3 SiH4-NH3-based gas as a nitrogen source. 基板温度优选30(T400°C。 The substrate temperature is preferably 30 (T400 ° C.
 作为本实施方式中使用的基板，可以列举出具有二极管、晶体管、化合物半导体、 热敏电阻、压敏电阻7夕）、闸流晶体管（寸4 U义夕）等单个半导体、DRAM(Dynamic Random Access Memory，动态随机存取存储器）、SRAM (Static Random Access Memory，静态随机存取存储器）、EPROM(Erasable Programmable Read-Only Memory，可擦写可编程只读存储器）、掩模ROM (Mask Read-Only Memory，掩模只读存储器）、EEPROM (Electrically Erasable Programmable Read-Only Memory,电可擦写可编程只读存储器）、闪存等存储元件、微处理器、DSP、ASIC等逻辑电路元件（理論回路素子）、MMIC(Monolithic Microwave Integrated Circuit,单片微波集成电路）所代表的化合物半导体等集成电路元件、混成集成电路（Hybrid 1C)、发光二极管、电荷耦合元件等光电转换元件等的基板。  As the substrate used in the present embodiment, Xi having 7 include diodes, transistors, compound semiconductors, thermistors, varistors), a thyristor (4 U Yi Xi inch) single semiconductor and the like, a DRAM ( dynamic random access memory, dynamic random access memory), SRAM (static random access memory, static random access memory), EPROM (Erasable programmable Read-Only memory, erasable programmable read-only memory), a mask ROM (mask Read-Only memory, a mask read only memory), EEPROM (electrically Erasable programmable Read-Only memory, electrically Erasable programmable Read Only memory), a flash memory storage device, a microprocessor, DSP, ASIC and other logic circuit elements ( the photoelectric conversion element circuit board sub-prime theory), MMIC (monolithic microwave Integrated circuit, monolithic microwave integrated circuit), etc. represented by the compound semiconductor integrated circuit device, hybrid integrated circuits (hybrid 1C), a light emitting diode, a charge coupled device of the like. 本实施方式的CMP研磨液不仅能够研磨形成于半导体基板上的氮化硅膜、氧化硅膜，而且能够对形成于具有规定布线的布线板上的氧化硅膜、玻璃、氮化硅等无机绝缘膜、 多晶硅、主要含有Al、Cu、Ti、TiN、W、Ta、TaN等的膜进行研磨。  CMP polishing liquid according to the present embodiment is not only formed on the silicon nitride film polishing on a semiconductor substrate, a silicon oxide film, but can be formed in the wiring board having a predetermined wiring of a silicon oxide film, glass, silicon nitride an inorganic insulating film, a polysilicon film containing mainly Al, Cu, Ti, TiN, W, Ta, TaN and the like is polished. 本实施方式的电子部件使用了通过前述研磨方法进行研磨而获得的基板。  the electronic component of the present embodiment uses a substrate obtained by polishing the polishing process. 电子部件不仅是半导体元件，还包括光掩模•透镜•棱镜等光学玻璃、ΙΤ0等无机导电膜、由玻璃和结晶材料构成的光集成电路•光开关元件•光波导、光纤的端面、闪烁体等光学用单晶、 固体激光单晶、蓝色激光LED用蓝宝石基板、SiC、GaP、GaAs等的半导体单晶、磁盘用玻璃基板、磁头等。 Not only the electronic component is a semiconductor element, further comprising an inorganic conductive film photomask • • prism optical glass lens, ΙΤ0 the like, optical integrated circuits • optical switching element made of a glass and a crystalline material • optical waveguide, the end face of the optical fiber, the scintillator single crystal and other optical, solid-state laser single crystals, blue laser LED sapphire semiconductor single crystal substrate, SiC, GaP, GaAs or the like, magnetic disk glass substrates, magnetic heads. 以下，通过实施例对本发明进行说明，但本发明不受这些实施例限定。  Hereinafter, the present invention will be described by way of examples, but these examples are not limiting embodiments of the present invention. 将碳酸铈水合物：40kg加入到氧化铝制容器中，在830°C下、空气中烧成2小时，获得20kg黄白色粉末。  A cerium carbonate hydrate: 40kg alumina was added to the vessel, at 830 ° C, calcined in air for 2 hours to obtain 20kg white powder. 通过X射线衍射法对该粉末进行相鉴别的结果是，确认其为氧化铈。 Results for phase identification by X-ray diffractometry of the powder is confirmed to be cerium oxide. 此外，通过激光衍射式粒度分布仪测定烧成粉末的粒径，结果是烧成粉末的粒径95%以上分布于1~100μηι之间。 In addition, particle size of the fired powder meter measured by a laser diffraction type particle size distribution, the result is fired powder particle size distribution of 95% or between 1 ~ 100μηι. 接着，使用喷射磨对前述氧化铈粉末：20kg进行干式粉碎。  Next, using a jet mill of the cerium oxide powder: 20kg dry-pulverized. 通过BET法测定多晶体的比表面积，结果为9. 4m2/g。 The specific surface area measured by the BET method polycrystal found to 9. 4m2 / g.
 将氧化铈粉末：10. 0kg和去离子水：116. 65kg混合，添加市售聚丙烯酸铵盐水溶液（重均分子量：8000,40质量％) :228g作为分散剂，获得氧化铺分散液。  The cerium oxide powder: 10 0kg and deionized water:.. 116 65kg are mixed, commercially available ammonium polyacrylate solution (weight average molecular weight: 8000,40 mass%): 228g as a dispersant, shop oxide dispersion obtained liquid. 将氧化铺分散液搅拌10分钟后，一边将液体送入另一容器，一边在送液的配管内照射超声波。 After laying oxide dispersion stirred for 10 minutes, while the liquid into another container, while the inner pipe of the ultrasonic waves in the liquid feeding. 超声波频率为400kHz，经30分钟输送氧化铈分散液。 Ultrasonic frequency of 400kHz, the delivery of 30 minutes cerium oxide dispersion. 在4个500mL烧杯中加入各500g±20g输送的氧化铈分散液，进行离心分离。  Each dispersion was added to the cerium oxide 500g ± 20g conveyed in four 500mL beaker, centrifuged. 在设定为施加于外周的离心力达到500G的条件下离心分离2分钟，除去烧杯底部沉降的氧化铺。 Centrifuged for 2 minutes at a centrifugal force is set to reach the outer periphery of 500G conditions, removal of the oxide deposition shop bottom of the beaker. 测定获得的氧化铈分散液（氧化铈浆料）的固体成分浓度，结果为4. 0质量％。  Determination of solid content concentration of the dispersion obtained cerium oxide (cerium oxide slurry) and the result was 4.0% by mass. 测定该浆料的pH，结果为9.0。 The pH of the slurry was found to be 9.0. 进而使用激光衍射式粒度分布仪〔株式会社堀场制作所制，商品名：LA-920〕，设折射率：1. 93、透过度：68%，对浆料中的氧化铈粒子的平均粒径进行测定，结果为0. 11 μ m。  Further by using a laser diffraction particle size distribution meter [manufactured by Horiba, Ltd., trade name: LA-920], the refractive index is provided: 193, permeability: 68%, cerium oxide particles in the slurry of the average particle diameter was measured and found to be 0. 11 μ m.
 此外，使用原子吸收光度计〔株式会社岛津制作所制，商品名：AA-6650〕测得的氧化铺楽料中的杂质离子（Na、K、Fe、Al、Zr、Cu、Si、Ti)以质量比计为lppm以下。  In addition, using an atomic absorption photometer [manufactured by Shimadzu Corporation, trade name: AA-6650] of impurity ions was measured in the compound oxide shop yue (Na, K, Fe, Al, Zr, Cu, si, Ti) lppm to mass ratio or less. 按照以下工序制作添加液。  Add solution prepared according to the following procedure. 将超纯水：900g称量到1000mL容器a中。  ultrapure water: 900g was weighed in to a 1000mL container. 将聚丙烯酸40质量％水溶液（重均分子量：3000) : 10. 0g加入到容器a中。  A 40 mass% aqueous solution of polyacrylic acid (weight average molecular weight: 3000): 10. 0g added to the vessel in a. 将表面活性剂：2, 4, 7, 9-四甲基-5-癸炔-4, 7-二醇的聚氧乙烯醚（U工卜今;一卜）：15. 〇g加入到容器a中。  The surfactant: 2, 4, 7, 9-tetramethyl-5-decyne -4, 7 diol polyoxyethylene ethers (U BU this work; a BU): 15 〇g. was added to the vessel in a. 以磷酸达到8. 5g的方式将85质量％的磷酸水溶液加入到容器a中。  8. 5g phosphate manner will reach 85% by mass of a phosphoric acid aqueous solution was added to the vessel. 将氨水（25质量％水溶液）加入到容器a中，调整添加量使添加液的pH达到7. 0。  Aqueous ammonia (25% aqueous solution) was added to a vessel in the addition amount of the pH adjusting liquid is added to reach 7.0. 加入适量超纯水，使得总计达到1000g，从而制成添加液。  adding an appropriate amount of ultrapure water, such that the totaled 1000g, was added to prepare a solution. 与实施例1同样地，按照表1所示的配合制作添加液。  the same manner as in Example 1, added was prepared according to the compounding shown in Table 1. 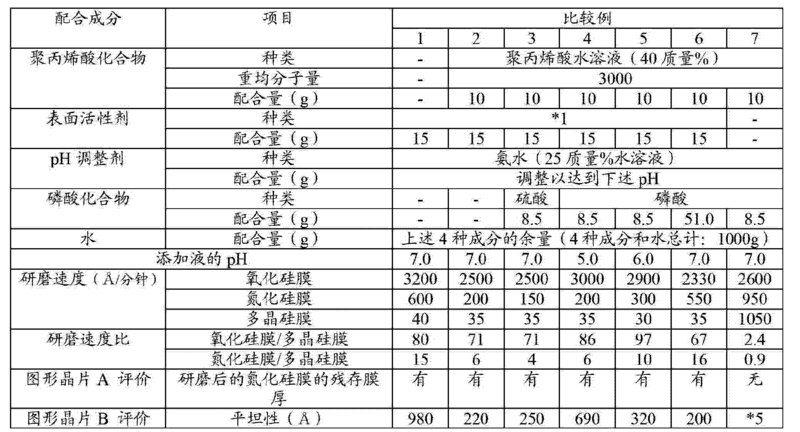 与实施例1同样地，按照表2所示的配合制作添加液。  1 in the same manner, in accordance with the additive solution shown in Table 2 prepared in Example. 将前述氧化铈浆料：500g、前述实施例1~11、比较例1~7所制作的添加液：500g和纯水：1500g混合，分别制作总计为2500g的CMP研磨液。  The aforementioned cerium oxide slurry: 500g of pure water and:: 1500g and mixed to produce a total of 2500g of the CMP polishing liquid 500g, Examples 1 to 11 and Comparative Examples 1 to 7 was added was prepared foregoing embodiment. 就绝缘膜CMP评价用试验晶片而言，作为未形成图形的Blanket晶片，使用在Si 基板上以l〇〇〇nm的膜厚成膜的氧化硅膜、在Si基板上以200nm的膜厚成膜的氮化硅膜和在Si基板上以lOOnm的膜厚成膜的多晶硅膜。  CMP on the insulating film evaluation test wafer, the pattern is not formed as Blanket wafers, used on an Si substrate to a thickness of l〇〇〇nm forming a silicon oxide film on the Si substrate at 200nm thickness of the silicon nitride film and a film on a Si substrate to a thickness of lOOnm deposition of a polysilicon film. 此外，作为形成有模拟图形的图形晶片，使用SEMATECH公司制的864晶片（商品名，直径：200mm)。  Further, as the pattern is formed with a simulated graphic of a wafer using a wafer 864 (trade name, diameter: 200mm) SEMATECH's Corporation. 如图2所不，图形晶片具备在表面具有沟槽的娃基板8、以避开沟槽的方式层叠在娃基板8上的氮化娃膜9、以填埋沟槽的方式层叠在娃基板8和氮化娃膜9上的氧化硅（Si0 2)膜（绝缘膜）10。 2 do not, baby patterned wafer comprises a substrate having a trench in the surface 8, so as to avoid the trench nitride film 9 laminated on a baby doll substrate 8, to fill the trench in a manner laminated substrate doll 8 and 9 on the silicon oxide nitride film baby (Si0 2) film (insulating film) 10. 氧化硅膜10通过HDP (High Density Plasma，高密度等离子体）法而成膜，在硅基板8和氮化硅膜9上膜厚均为600nm。 The silicon oxide film 10 by HDP (High Density Plasma, high-density plasma) method to form a film thickness of 600nm on a silicon substrate are 8 and 9 the silicon nitride film. 具体而言，氮化硅膜9的膜厚为150nm，氧化硅膜10的凸部的膜厚为600nm，氧化硅膜10的凹部的膜厚为600nm，氧化硅膜10的凹部深度为500nm(沟槽深度350nm+氮化硅膜厚150nm)。 Specifically, the film thickness of the silicon nitride film 9 is 150nm, the film thickness of the convex portion of the silicon oxide film 10 of 600 nm, the film thickness of the concave portion of the silicon oxide film 10 of 600 nm, a depth of the concave portion 10 of the silicon oxide film 500 nm ( + a thickness of the silicon nitride trench depth 350nm 150nm). 研磨评价时，使用的是利用公知的能够相对于氮化硅膜充分选择性地研磨氧化硅膜的CMP研磨液对上述晶片进行研磨而使氮化硅膜露出的状态的晶片（图形晶片A)。 When the evaluation of polishing by CMP using a polishing liquid known with respect to the silicon nitride film is sufficiently selective polishing of the silicon oxide film on the silicon of the wafer is polished wafer (wafer pattern A) of the film exposed state . 此外，使用了与图形晶片A具有同样构造且形成有膜厚：150nm的多晶硅膜来代替氮化硅膜的晶片（图形晶片B)。  Also, a wafer with pattern A has the same configuration and is formed with a film thickness: 150nm polysilicon film instead of the wafer (wafer pattern B) silicon nitride film. 图形晶片评价中，使用线（凸部）和空隙（凹部）宽度为200μπι间距、凸部图形密度为50%的晶片。  Evaluation of pattern wafer, using a wire (convex portion) and a gap (recess) pitch 200μπι width, pattern density of the convex portion was 50% of the wafer. 线和空隙为模拟的图形，为作为凸部的被Si 3N4遮盖的主部（Active部)和作为凹部的形成有槽的槽部（Trench部）交互排列而成的图形。 Void line and an analog pattern, are arranged to operate as (Trench portion) of the main portion interact Si (the Active portion) and the groove portions covered 3N4 groove as a concave portion formed by the convex portion pattern. 例如，"线和空隙为100 μ m 间距"是指线部和空隙部的宽度总计为ΙΟΟμπι。 For example, a "line of 100 μ m and a void pitch" refers to the gap width of the line portion and the portion of total ΙΟΟμπι. 此外，例如，"凸部图形密度为10%"是指凸部宽度：1〇μ m和凹部宽度：90 μ m交互排列而成的图形，凸部图形密度90%是指凸部宽度： 90 μ m和凹部宽度：10 μ m交互排列而成的图形。 Further, for example, "convex portion pattern density of 10%" means the convex width: 1〇μ m and the recess width: 90 [mu] m formed alternately arranged pattern, 90% pattern density of the protrusions refers to the convex width: 90 μ m and the recess width: 10 μ m formed alternately arranged pattern. 将上述试验晶片设置在研磨装置（应用材料7 7 4 U 7 >)公司制，商品名：MIRRA3400)的贴合有安装基板用的吸附衬垫的固定器上。  The above test wafer polishing apparatus provided (Applied 7 7 4 U 7>) Corporation, trade name: the paste MIRRA3400) laminated with a substrate for mounting the suction pad holder. 此外，在200mm晶片用的研磨平台上贴合多孔聚氨酯树脂制的研磨衬垫（Rodel (口r 一>)公司制，型号：IC-1010)。 In addition, 200mm wafers in polishing platform polishing pad laminated to a porous polyurethane resin (Rodel (a port r>) Corporation, Model: IC-1010). 在前述研磨衬垫上，放置绝缘膜面朝下的固定器，将膜压力设定为31kPa。  On the polishing pad, the fixture is placed face down in the insulating film, the film pressure was 31kPa. 在研磨平台上，一边以160mL/分钟的速度滴加前述氧化铈浆料，同时以40mL/分钟的速度滴加实施例1~11、比较例1~7的添加液，一边分别以123rpm、113rpm使研磨平台和晶片运转，对氧化硅膜（P-TE0S膜）、氮化硅膜、多晶硅膜的Blanket晶片分别研磨1分钟。  In the polishing platen, at a speed of 160mL / min of the cerium oxide slurry was added dropwise, at a rate of 40mL / min was dropped Examples 1 to 11 and Comparative Examples 1 to 7 were added, respectively, while 123rpm, 113rpm and internet wafer polishing operation, the silicon oxide film (P-TE0S film), a silicon nitride film, a polysilicon film polishing Blanket wafer 1 minute, respectively. 此外，对图形晶片A、B分别研磨100秒钟。  Further, on the patterned wafer A, B are polished for 100 seconds. 将研磨后的晶片用纯水充分清洗后，干燥。  After the polished wafer was sufficiently washed with pure water, and dried. 然后，对氧化硅膜、氮化硅膜、和多晶硅膜的Blanket晶片，使用光干涉式膜厚装置（大日本Screen ( 7U - ^)制造株式会社制，商品名：RE-3000)，测定晶片面内55点的残存膜厚，由比研磨前的膜厚减少量算出每1分钟的研磨速度。  Then, Blanket wafer of silicon oxide film, a silicon nitride film, and a polysilicon film, using an optical interference film thickness means (Dainippon Screen (7U - ^) Manufacturing Co., Ltd., trade name: RE-3000) a residual thickness of 55 points in the wafer surface was measured by the amount of reduced thickness ratio before polishing per minute of polishing rate was calculated. 对于图形晶片，使用光干涉式膜厚装置（大日本Screen制造株式会社制，商品名：RE-3000)，测定图形晶片A的氮化硅膜的残存膜厚、和图形晶片B的凹部的绝缘膜的残存膜厚、凸部的绝缘膜的残存膜厚。 For patterned wafer, using an optical interference film thickness means (Dainippon Screen Mfg. Co., Ltd., trade name: RE-3000), measuring the remaining film thickness of the insulating concave portion of the silicon nitride film pattern wafer A and the wafer B to pattern the remaining thickness of a film, the residual film thickness of the insulating convex portion. 并且，将图形晶片B的凸部的绝缘膜和凹部的绝缘膜的残存膜厚之差作为平坦性。 Then, the difference of remaining thickness of the insulating film of the insulating film pattern convex portions and the concave portion B of the wafer as the flatness. 将获得的各测定结果示于上述表1和2中。  The obtained results of each measurement are shown in Tables 1 and 2 above. 如表1和2所示，就实施例1~11而言，观察研磨速度之比时，可知氧化硅膜/多晶硅膜为64~110,氮化硅膜/多晶硅膜为18以上，多晶硅膜的研磨速度被抑制在40A/分钟以下，在抑制多晶硅膜的研磨速度的同时，提高了氧化硅膜和氮化硅膜的研磨速度。  As shown in Tables 1 and 2, described for Examples 1 to 11, the ratio of the polishing speed when seen, apparent silicon oxide film / a polycrystalline silicon film of 64 to 110, the silicon nitride film / a polycrystalline silicon film 18 or more, the polysilicon film polishing rate is suppressed at 40A / min or less, while suppressing the polishing rate of the polysilicon film, to improve the polishing rate of silicon oxide film and a silicon nitride film. 对比实施例1~11和比较例广7,可知实施例1~11尤其提高了氮化硅膜的研磨速度。  Comparative Examples 1 to 11 and Comparative Examples 7 wide, found in particular of Examples 1 to 11 to improve the polishing rate of the silicon nitride film. 此外，根据利用图形晶片A的评价结果，可知实施例1~11能够充分研磨氮化硅膜。 Further, according to the evaluation results of the wafer A using the pattern, it was found in Examples 1 to 11 can be sufficiently polished silicon nitride film. 进而，根据利用图形晶片B的评价结果，可知实施例1~11平坦性的值均小，平坦性良好。 Further, according to the results of the evaluation using the patterned wafer B, 1 to 11, the flatness of the apparent value embodiments are small, good flatness. 1…娃、2…绝缘物、3…绝缘膜、4…虚拟栅、5…侧壁、6…应力膜、7…氧化娃膜、8… 娃基板、9…氮化娃膜、10···氧化娃膜、100, 200…基板。  1 ... baby, ... insulator 2, 3 ... insulating film, the dummy gate 4 ..., 5 ... side wall film stress ... 6, 7 ... baby oxide film, the substrate 8 ... baby, baby nitride film 9 ..., baby ????? oxide film 10, 100, 200 ... substrate. 1. 一种CMP研磨液，其为将第1液和第2液混合使用的CMP研磨液， 所述第1液含有包含氧化铈粒子的铈系研磨粒、分散剂和水， 所述第2液含有聚丙烯酸化合物、表面活性剂、磷酸或磷酸衍生物中的至少一方的磷酸化合物和水， 所述第1液的pH为7.0以上， 所述第2液的pH为6. 5以上， 以所述磷酸化合物的含量在以CMP研磨液总质量为基准时达到0. 01〜1. 0质量％的方式混合所述第1液和所述第2液。 A CMP polishing liquid, which is a CMP polishing liquid to the first liquid and the second liquid mixture, said first liquid containing a cerium-based abrasive grain comprises cerium oxide particles, a dispersant and water, the second solution containing polyacrylic acid compound, surfactant, acid or phosphoric acid derivative, at least one phosphate compound and water, pH of the first liquid is 7.0 or more, pH of the second liquid is 6.5 or more, in order to the content of the phosphate compound reaches 0. 01~1. 0% by mass when the total mass of the CMP polishing liquid to the first reference liquid and mixing the second liquid. 2. 根据权利要求1所述的CMP研磨液，其中，所述第1液的pH为7. 0〜12. 0。 2. CMP polishing liquid according to claim 1, wherein, pH of the first liquid 7. 0~12 0. 3. 根据权利要求1所述的CMP研磨液，其中，所述第1液的pH为7. 0〜11. 0。 3. The CMP polishing liquid according to claim 1, wherein, pH of the first liquid 7. 0~11 0. 4. 根据权利要求1所述的CMP研磨液，其中，所述铈系研磨粒由氧化铈粒子构成。 4. The CMP polishing liquid according to claim 1, wherein the cerium-based abrasive grains composed of cerium oxide particles. 5. 根据权利要求1所述的CMP研磨液，其中，所述氧化铈粒子为通过烧成或氧化法而制造的粒子。 Particles 5. CMP polishing liquid according to claim 1, wherein said cerium oxide particles by oxidation or calcination manufactured. 6. 根据权利要求1所述的CMP研磨液，其中，所述氧化铈粒子为通过对铈化合物进行氧化而获得的粒子，所述铈化合物为碳酸盐、硝酸盐、硫酸盐、草酸盐。 The CMP polishing liquid according to claim 1, wherein the particles of the cerium oxide particles by oxidation of the obtained cerium compound, the cerium compound is a carbonate, nitrate, sulfate, oxalate . 7. 根据权利要求5所述的CMP研磨液，其中，所述烧成的温度为350〜900°C。 7. CMP polishing liquid according to claim 5, wherein the firing temperature is 350~900 ° C.
8. 根据权利要求1所述的CMP研磨液，其中，所述铈系研磨粒含有具有晶界的多晶体铈系研磨粒。 The CMP polishing liquid according to claim 1, wherein the cerium-based abrasive grain comprising abrasive grains having a polycrystalline cerium grain boundaries. 9. 根据权利要求1所述的CMP研磨液，其中，所述铈系研磨粒的微晶直径为1〜400nm。 9. The CMP polishing liquid according to claim 1, wherein the cerium-based abrasive grains crystallite diameter 1~400nm. 13. 根据权利要求1所述的CMP研磨液，其中，所述铈系研磨粒的含量在以CMP研磨液总质量为基准时，为〇. 2〜3. 0质量％。 13. CMP polishing liquid according to claim 1, wherein the content of the cerium-based abrasive grains when the total mass of the CMP polishing liquid as a reference for the square. 2 ~. 0% by mass. 14. 根据权利要求1所述的CMP研磨液，其中，所述铈系研磨粒的含量在以CMP研磨液总质量为基准时，为〇. 3〜2. 0质量％。 14. A CMP polishing liquid according to claim 1, wherein the content of the cerium-based abrasive grains when the total mass of the CMP polishing liquid as a reference for the square. 3~2. 0% by mass. 15. 根据权利要求1所述的CMP研磨液，其中，所述铈系研磨粒的含量在以CMP研磨液总质量为基准时，为〇. 5〜1. 5质量％。 15. A CMP polishing liquid according to claim 1, wherein the content of the cerium-based abrasive grains when the total mass of the CMP polishing liquid as a reference for the square. 5~1. 5 mass%. 16. 根据权利要求1所述的CMP研磨液，其中，对于所述第1液，作为所述分散剂为水溶性阴离子性分散剂、水溶性非离子性分散剂、水溶性阳离子性分散剂、水溶性两性分散剂。 16. CMP polishing liquid according to claim 1, wherein, for the first liquid, as the dispersing agent is a water-soluble anionic dispersant, a water-soluble nonionic dispersant, a water-soluble cationic dispersant, water-soluble amphoteric dispersant. 17. 根据权利要求16所述的CMP研磨液，其中，所述水溶性阴离子性分散剂为月桂基硫酸三乙醇胺、月桂基硫酸铵、聚氧乙烯烷基醚硫酸三乙醇胺、聚羧酸型高分子分散剂。 17. CMP polishing liquid according to claim 16, wherein said water-soluble anionic dispersing agent is triethanolamine lauryl sulfate, ammonium lauryl sulfate, polyoxyethylene alkyl ether sulfuric acid triethanol amine, polycarboxylic acid type high molecular dispersant. 18. 根据权利要求1所述的CMP研磨液，其中，所述第1液含有聚羧酸型高分子分散剂作为所述分散剂。 18. The CMP polishing liquid according to claim 1, wherein said first liquid containing a polycarboxylic acid type polymeric dispersant as the dispersant. 19. 根据权利要求18所述的CMP研磨液，其中，所述聚羧酸型高分子分散剂的重均分子量为100000以下。 The CMP polishing liquid 19. The weight of claim 18, wherein said polycarboxylic acid type polymer dispersant average molecular weight of 100,000 or less. 20. 根据权利要求18所述的CMP研磨液，其中，所述聚羧酸型高分子分散剂为具有不饱和双键的羧酸单体的聚合物、具有不饱和双键的羧酸单体和其它具有不饱和双键的单体的共聚物以及它们的铵盐、胺盐。 20. The CMP polishing liquid according to claim 18, wherein said polycarboxylic acid type polymer dispersant is a polymer having an unsaturated double bond of carboxylic acid monomer, an unsaturated carboxylic acid monomer double bond and other copolymers of monomers having an unsaturated double bond and their ammonium salts, amine salts. 21. 根据权利要求20所述的CMP研磨液，其中，所述具有不饱和双键的羧酸单体为丙烯酸、甲基丙烯酸、马来酸、富马酸、衣康酸。 21. The CMP polishing liquid according to claim 20, wherein said carboxylic acid having an unsaturated double bond monomers are acrylic acid, methacrylic acid, maleic acid, fumaric acid, itaconic acid. 22. 根据权利要求1所述的CMP研磨液，其中，所述第1液含有聚丙烯酸系分散剂作为所述分散剂。 22. CMP polishing liquid according to claim 1, wherein said first liquid containing a polyacrylic acid dispersant as the dispersant. 23. 根据权利要求22所述的CMP研磨液，其中，所述聚丙烯酸系分散剂为以丙烯酸铵盐作为构成单元的高分子分散剂。 23. CMP polishing liquid according to claim 22, wherein said dispersant is a polyacrylic acid ammonium salt of acrylic acid as a constituent unit of the polymer dispersant. 24. 根据权利要求23所述的CMP研磨液，其中，所述以丙烯酸铵盐作为构成单元的高分子分散剂为聚丙烯酸铵盐、丙烯酸烷基酯与丙烯酸的共聚物的铵盐。 24. CMP polishing liquid according to claim 23, wherein said acrylic acid ammonium salt as a constituent unit of the polymer dispersant is polyacrylic acid ammonium salt, an ammonium salt of a copolymer of alkyl acrylate and acrylic acid. 25. 根据权利要求1所述的CMP研磨液，其中，所述第2液的pH为6. 7〜12. 0。 25. CMP polishing liquid according to claim 1, wherein, pH of the second solution is 7~12 6. 0. 26. 根据权利要求1所述的CMP研磨液，其中，所述第2液的pH为6. 8〜11. 0。 26. CMP polishing liquid according to claim 1, wherein, pH of the second solution is 8~11 6. 0. 27. 根据权利要求1所述的CMP研磨液，其中，所述第2液进一步含有pH调整剂。 27. The CMP polishing liquid according to claim 1, wherein the second liquid further comprises a pH adjusting agent. 28. 根据权利要求27所述的CMP研磨液，其中，所述pH调整剂为pKa为8以上的碱性化合物。 28. CMP polishing liquid according to claim 27, wherein the pH adjusting agent having a pKa of 8 or more basic compounds. 29. 根据权利要求28所述的CMP研磨液，其中，所述pKa为8以上的碱性化合物为水溶性的有机胺、氨水。 29. CMP polishing liquid according to claim 28, wherein the pKa of 8 or more water-soluble organic basic compound is an amine, ammonia. 30. 根据权利要求29所述的CMP研磨液，其中，所述有机胺为乙胺、二乙胺、三乙胺、二苯胍、哌啶、丁胺、二丁胺、异丙胺、四甲基氢氧化铵、四甲基氯化铵、四甲基溴化铵、四甲基氟化铵、四丁基氢氧化铵、四丁基氯化铵、四丁基溴化铵、四丁基氟化铵、四甲基铵硝酸盐、 四甲基铵醋酸盐、四甲基铵丙酸盐、四甲基铵马来酸盐、四甲基铵硫酸盐。 30. CMP polishing liquid according to claim 29, wherein the organic amine is ethylamine, diethylamine, triethylamine, diphenyl guanidine, piperidine, butylamine, dibutylamine, diisopropylamine, tetramethylammonium ammonium hydroxide, tetramethyl ammonium chloride, tetramethyl ammonium bromide, tetramethylammonium fluoride, tetrabutylammonium hydroxide, tetrabutylammonium chloride, tetrabutylammonium bromide, tetrabutylammonium fluoride ammonium, tetramethyl ammonium nitrate, tetramethylammonium acetate, tetramethylammonium propionate, tetramethylammonium maleate, tetramethylammonium sulfate. 31. 根据权利要求27所述的CMP研磨液，其中，所述pH调整剂为碱性化合物，所述pH 调整剂的含量在以CMP研磨液总质量为基准时，为0. 01〜10. 0质量％。 31. CMP polishing liquid according to claim 27, wherein the pH adjusting agent is a basic compound, the content of the pH adjusting agent in the total mass of the CMP polishing liquid as a reference, 0. 01~10. 0% by mass. 32. 根据权利要求27所述的CMP研磨液，其中，所述pH调整剂为碱性化合物，所述pH 调整剂的含量在以CMP研磨液总质量为基准时，为0. 05〜5. 0质量％。 32. A CMP polishing liquid according to claim 27, wherein the pH adjusting agent is a basic compound, the content of the pH adjusting agent in the total mass of the CMP polishing liquid as a reference, 0. 05~5. 0% by mass. 33. 根据权利要求27所述的CMP研磨液，其中，所述pH调整剂为碱性化合物，所述pH 调整剂的含量在以CMP研磨液总质量为基准时，为0. 1〜3. 0质量％。 33. A CMP polishing liquid according to claim 27, wherein the pH adjusting agent is a basic compound, the content of the pH adjusting agent in the total mass of the CMP polishing liquid as a reference, 0. 1 ~ 3. 0% by mass. 34. 根据权利要求1所述的CMP研磨液，其中，所述第2液所含有的所述聚丙烯酸化合物为由丙烯酸均聚物形成的聚丙烯酸、丙烯酸和水溶性的丙烯酸烷基酯的共聚物。 34. The CMP polishing liquid according to claim 1, wherein the compound of the polyacrylic acid contained in the second liquid by the copolymerization of acrylic acid homopolymers, polyacrylic acid, water-soluble acrylic acid and alkyl acrylate formed thereof. 35. 根据权利要求1所述的CMP研磨液，其中，所述第2液所含有的所述聚丙烯酸化合物为聚丙烯酸、丙烯酸和丙烯酸甲酯的共聚物、丙烯酸和甲基丙烯酸的共聚物、丙烯酸和丙烯酸乙酯的共聚物。 35. The CMP polishing liquid according to claim 1, wherein said polyacrylic acid compound contained in the second liquid is a copolymer of polyacrylic acid, copolymers of acrylic acid and methyl acrylate, acrylic acid and methacrylic acid, copolymers of acrylic acid and ethyl acrylate. 36. 根据权利要求1所述的CMP研磨液，其中，所述第2液所含有的所述聚丙烯酸化合物为聚丙烯酸。 36. CMP polishing liquid according to claim 1, wherein the compound of the polyacrylic acid contained in the second liquid is polyacrylic acid. 37. 根据权利要求1所述的CMP研磨液，其中，所述第2液所含有的所述聚丙烯酸化合物的重均分子量为500000以下。 37. CMP polishing liquid according to claim 1, wherein the weight of the polyacrylic acid compound contained in the second liquid-average molecular weight of 500,000 or less. 38. 根据权利要求1所述的CMP研磨液，其中，所述第2液所含有的所述聚丙烯酸化合物的重均分子量为50000以下。 38. CMP polishing liquid according to claim 1, wherein the weight of the polyacrylic acid compound contained in the second liquid-average molecular weight of 50,000 or less. 39. 根据权利要求1所述的CMP研磨液，其中，所述第2液所含有的所述聚丙烯酸化合物的含量在以CMP研磨液总质量为基准时，为0. 05〜2. 0质量％。 39. The CMP polishing liquid according to claim 1, wherein the content of the polyacrylic acid compound contained in the second liquid in the total mass of the CMP polishing liquid as a reference, 0. 05~2. 0 mass %. 40. 根据权利要求1所述的CMP研磨液，其中，所述第2液所含有的所述聚丙烯酸化合物的含量在以CMP研磨液总质量为基准时，为0. 08〜1. 8质量％。 40. The CMP polishing liquid according to claim 1, wherein the content of the polyacrylic acid compound contained in the second liquid in the total mass of the CMP polishing liquid as a reference, 0. 08~1. 8 mass %. 41. 根据权利要求1所述的CMP研磨液，其中，所述第2液所含有的所述聚丙烯酸化合物的含量在以CMP研磨液总质量为基准时，为0. 10〜1. 5质量％。 41. The CMP polishing liquid according to claim 1, wherein the content of the polyacrylic acid compound contained in the second liquid in the total mass of the CMP polishing liquid as a reference, 0. 10~1. 5 mass %. 42. 根据权利要求1所述的CMP研磨液，其中，所述第2液含有阴离子性表面活性剂、非离子性表面活性剂、阳离子性表面活性剂、两性离子性表面活性剂作为所述表面活性剂。 42. The CMP polishing liquid according to claim 1, wherein said second liquid containing an anionic surfactant, nonionic surfactant, cationic surfactant, zwitterionic surfactant as the surface active agent. 43. 根据权利要求1所述的CMP研磨液，其中，所述第2液含有非离子性表面活性剂作为所述表面活性剂。 43. The CMP polishing liquid according to claim 1, wherein the second liquid contains a nonionic surfactant as the surfactant. 44. 根据权利要求43所述的CMP研磨液，其中，所述非离子性表面活性剂为醚型表面活性剂、酯型表面活性剂、氨基醚型表面活性剂、醚酯型表面活性剂、烷醇酰胺型表面活性剂、 乙炔系二醇的环氧乙烷加成物、聚乙烯吡咯烷酮、聚丙烯酰胺、聚二甲基丙烯酰胺。 44. CMP polishing liquid according to claim 43, wherein said nonionic surfactant is an ether-type surfactants, ester surfactants, aminoether surfactants, ether ester type surfactants, alkanolamide surfactants, acetylene glycol-based ethylene oxide adduct, polyvinyl pyrrolidone, polyacrylamide, polydimethyl acrylamide. 45. 根据权利要求44所述的CMP研磨液，其中，所述醚型表面活性剂为聚氧丙烯、聚氧乙烯烷基醚、聚氧乙烯烷基烯丙基醚、聚氧乙烯聚氧丙烯醚衍生物、聚氧丙烯甘油基醚、聚乙二醇、甲氧基聚乙二醇、乙炔系二醇的环氧乙烷加成物。 45. The CMP polishing liquid according to claim 44, wherein the ether type surfactant is a polyoxypropylene, polyoxyethylene alkyl ethers, polyoxyethylene alkyl allyl ether, polyoxyethylene polyoxypropylene ether derivative, polyoxypropylene glyceryl ether, polyethylene glycol, methoxy polyethylene glycol, an acetylene-based diol ethylene oxide adduct. 46. 根据权利要求44所述的CMP研磨液，其中，所述醚酯型表面活性剂为聚氧乙烯山梨糖醇酐脂肪酸酯、聚氧乙烯甘油硼酸酯脂肪酸酯、聚氧乙烯烷基酯。 46. ​​The CMP polishing liquid according to claim 44, wherein the ether ester type surfactant is a polyoxyethylene sorbitan fatty acid esters, sorbitan, polyoxyethylene glycerol borate fatty acid esters, polyoxyethylene alkyl ester. 47. 根据权利要求1所述的CMP研磨液，其中，所述表面活性剂的含量在以CMP研磨液总质量为基准时，为〇. 01〜1. 〇质量％。 47. The CMP polishing liquid according to claim 1, wherein the content of the surfactant in the CMP polishing liquid to the total mass as a reference for the square. 01~1. Billion mass%. 48. 根据权利要求1所述的CMP研磨液，其中，所述表面活性剂的含量在以CMP研磨液总质量为基准时，为〇. 02〜0. 7质量％。 48. The CMP polishing liquid according to claim 1, wherein the content of the surfactant in the CMP polishing liquid to the total mass as a reference for the square. 02~0. 7 mass%. 49. 根据权利要求1所述的CMP研磨液，其中，所述表面活性剂的含量在以CMP研磨液总质量为基准时，为〇. 03〜0. 5质量％。 49. The CMP polishing liquid according to claim 1, wherein the content of the surfactant in the CMP polishing liquid to the total mass as a reference for the square. 03~0. 5 mass%. 50. 根据权利要求1所述的CMP研磨液，其中，所述磷酸化合物为磷酸。 50. CMP polishing liquid according to claim 1, wherein said phosphate compound is phosphoric acid. 51. 根据权利要求1所述的CMP研磨液，其中，所述磷酸化合物为磷酸衍生物。 51. CMP polishing liquid according to claim 1, wherein said phosphoric acid compound is a phosphoric acid derivative. 52. 根据权利要求51所述的CMP研磨液，其中，所述磷酸衍生物为磷酸聚合物、磷酸氢钠、磷酸钠、磷酸铵、磷酸钾、磷酸钙、焦磷酸钠、聚磷酸、聚磷酸钠、偏磷酸、偏磷酸钠、磷酸铵。 52. CMP polishing liquid according to claim 51, wherein the acid is phosphoric acid derivative polymers, sodium hydrogen phosphate, sodium phosphate, ammonium phosphate, potassium phosphate, calcium phosphate, sodium pyrophosphate, polyphosphoric acid, polyphosphoric acid sodium metaphosphate, sodium metaphosphate, ammonium. 53. 根据权利要求1所述的CMP研磨液，其中，所述磷酸化合物的含量在以CMP研磨液总质量为基准时，为〇. 01〜1. 〇质量％。 53. CMP polishing liquid according to claim 1, wherein the content of the phosphate compound in the total mass of the CMP polishing liquid as a reference for the square. 01~1. Billion mass%. 54. 根据权利要求1所述的CMP研磨液，其中，所述磷酸化合物的含量在以CMP研磨液总质量为基准时，为〇. 02〜0. 7质量％。 54. The CMP polishing liquid according to claim 1, wherein the content of the phosphate compound in the total mass of the CMP polishing liquid as a reference for the square. 02~0. 7 mass%. 55. 根据权利要求1所述的CMP研磨液，其中，所述磷酸化合物的含量在以CMP研磨液总质量为基准时，为〇. 03〜0. 5质量％。 55. CMP polishing liquid according to claim 1, wherein the content of the phosphate compound in the total mass of the CMP polishing liquid as a reference for the square. 03~0. 5 mass%. 56. -种CMP研磨液，其为将第1液和第2液混合而得到的CMP研磨液， 所述第1液含有包含氧化铈粒子的铈系研磨粒、分散剂和水， 所述第2液含有聚丙烯酸化合物、表面活性剂、磷酸或磷酸衍生物中的至少一方的磷酸化合物和水， 所述第1液的pH为7.0以上， 所述第2液的pH为6. 5以上， 含有包含氧化铈粒子的铈系研磨粒、分散剂、聚丙烯酸化合物、表面活性剂、磷酸或磷酸衍生物中的至少一方的磷酸化合物和水， 所述磷酸化合物的含量在以CMP研磨液总质量为基准时为0. 01〜1. 0质量％。 56. - Species CMP polishing liquid, CMP polishing liquid as the first liquid and the second liquid obtained by mixing a first liquid containing a cerium-based abrasive grain comprises cerium oxide particles, a dispersant and water, said first 2 solution containing polyacrylic acid compound, a surfactant, water and at least one phosphoric acid compound or phosphoric acid derivatives, the pH of the first liquid is 7.0 or more, the pH of the second liquid is 6.5 or more, containing CMP polishing liquid to the total mass, the content of the cerium-based abrasive grain dispersing agent, polyacrylic acid compound, a surfactant, phosphoric acid derivatives, or at least one phosphate compound and water, the phosphate compound containing cerium oxide particles in as the reference 0. 01~1. 0% by mass. 57. 根据权利要求56所述的CMP研磨液，其中，所述第1液的pH为7. 0〜12. 0。 57. CMP polishing liquid according to claim 56, wherein, pH of the first liquid 7. 0~12 0. 58. 根据权利要求56所述的CMP研磨液，其中，所述第1液的pH为7. 0〜11. 0。 58. CMP polishing liquid according to claim 56, wherein, pH of the first liquid 7. 0~11 0. 59. 根据权利要求56所述的CMP研磨液，其中，所述铺系研磨粒由氧化铺粒子构成。 59. CMP polishing liquid according to claim 56, wherein said abrasive grains composed of a shop based oxide particles shop. 60. 根据权利要求56所述的CMP研磨液，其中，所述氧化铈粒子为通过烧成或氧化法而制造的粒子。 60. A particle as claimed in claim CMP polishing liquid according to claim 56, wherein said cerium oxide particles by oxidation or calcination manufactured. 61. 根据权利要求56所述的CMP研磨液，其中，所述氧化铈粒子为通过对铈化合物进行氧化而获得的粒子，所述铈化合物为碳酸盐、硝酸盐、硫酸盐、草酸盐。 61. CMP polishing liquid according to claim 56, wherein said particles are cerium oxide particles by oxidizing cerium compound obtained by the cerium compound is a carbonate, nitrate, sulfate, oxalate . 62. 根据权利要求60所述的CMP研磨液，其中，所述烧成的温度为350〜900°C。 62. CMP polishing liquid according to claim 60, wherein the firing temperature is 350~900 ° C.
63. 根据权利要求56所述的CMP研磨液，其中，所述铈系研磨粒含有具有晶界的多晶体铺系研磨粒。 63. The CMP polishing liquid according to claim 56, wherein said abrasive grains containing cerium-based abrasive grains having a polycrystalline plated grain boundaries. 68. 根据权利要求56所述的CMP研磨液，其中，所述铈系研磨粒的含量在以CMP研磨液总质量为基准时，为〇. 2〜3. 0质量％。 68. CMP polishing liquid according to claim 56, wherein the content of the cerium-based abrasive grains when the total mass of the CMP polishing liquid as a reference for the square. 2 ~. 0% by mass. 69. 根据权利要求56所述的CMP研磨液，其中，所述铈系研磨粒的含量在以CMP研磨液总质量为基准时，为〇. 3〜2. 0质量％。 69. CMP polishing liquid according to claim 56, wherein the content of the cerium-based abrasive grains when the total mass of the CMP polishing liquid as a reference for the square. 3~2. 0% by mass. 70. 根据权利要求56所述的CMP研磨液，其中，所述铈系研磨粒的含量在以CMP研磨液总质量为基准时，为〇. 5〜1. 5质量％。 70. CMP polishing liquid according to claim 56, wherein the content of the cerium-based abrasive grains when the total mass of the CMP polishing liquid as a reference for the square. 5~1. 5 mass%. 71. 根据权利要求56所述的CMP研磨液，其中，作为所述分散剂为水溶性阴离子性分散齐U、水溶性非离子性分散剂、水溶性阳离子性分散剂、水溶性两性分散剂。 71. CMP polishing liquid according to claim 56, wherein, as said dispersing agent is a water-soluble anionic dispersing homogeneous U, a water-soluble nonionic dispersant, a water-soluble cationic dispersant, a water-soluble amphoteric dispersant. 72. 根据权利要求71所述的CMP研磨液，其中，所述水溶性阴离子性分散剂为月桂基硫酸三乙醇胺、月桂基硫酸铵、聚氧乙烯烷基醚硫酸三乙醇胺、聚羧酸型高分子分散剂。 72. CMP polishing liquid according to claim 71, wherein said water-soluble anionic dispersing agent is triethanolamine lauryl sulfate, ammonium lauryl sulfate, polyoxyethylene alkyl ether sulfuric acid triethanol amine, polycarboxylic acid type high molecular dispersant. 73. 根据权利要求56所述的CMP研磨液，其中，含有聚羧酸型高分子分散剂作为所述分散剂。 73. The CMP polishing liquid according to claim 56, wherein, comprising the polycarboxylic acid type polymeric dispersant as the dispersant. 74. 根据权利要求73所述的CMP研磨液，其中，所述聚羧酸型高分子分散剂的重均分子量为100000以下。 Weight 74. The CMP polishing liquid according to claim 73, wherein said polycarboxylic acid type polymer dispersant average molecular weight of 100,000 or less. 75. 根据权利要求73所述的CMP研磨液，其中，所述聚羧酸型高分子分散剂为具有不饱和双键的羧酸单体的聚合物、具有不饱和双键的羧酸单体和其它具有不饱和双键的单体的共聚物以及它们的铵盐、胺盐。 75. The CMP polishing liquid according to claim 73, wherein said polycarboxylic acid type polymer dispersant is a polymer having an unsaturated double bond of carboxylic acid monomer, an unsaturated carboxylic acid monomer double bond and other copolymers of monomers having an unsaturated double bond and their ammonium salts, amine salts. 76. 根据权利要求75所述的CMP研磨液，其中，所述具有不饱和双键的羧酸单体为丙烯酸、甲基丙烯酸、马来酸、富马酸、衣康酸。 76. The CMP polishing liquid according to claim 75, wherein said carboxylic acid having an unsaturated double bond monomers are acrylic acid, methacrylic acid, maleic acid, fumaric acid, itaconic acid. 77. 根据权利要求56所述的CMP研磨液，其中，含有聚丙烯酸系分散剂作为所述分散剂。 77. CMP polishing liquid according to claim 56, wherein the dispersant comprises polyacrylic acid as the dispersing agent. 78. 根据权利要求77所述的CMP研磨液，其中，所述聚丙烯酸系分散剂为以丙烯酸铵盐作为构成单元的高分子分散剂。 78. CMP polishing liquid according to claim 77, wherein said dispersant is a polyacrylic acid ammonium salt of acrylic acid as a constituent unit of the polymer dispersant. 79. 根据权利要求78所述的CMP研磨液，其中，所述以丙烯酸铵盐作为构成单元的高分子分散剂为聚丙烯酸铵盐、丙烯酸烷基酯与丙烯酸的共聚物的铵盐。 79. CMP polishing liquid according to claim 78, wherein said acrylic acid ammonium salt as a constituent unit of the polymer dispersant is polyacrylic acid ammonium salt, an ammonium salt of a copolymer of alkyl acrylate and acrylic acid. 80. 根据权利要求56所述的CMP研磨液，其中，所述第2液的pH为6. 7〜12. 0。 80. 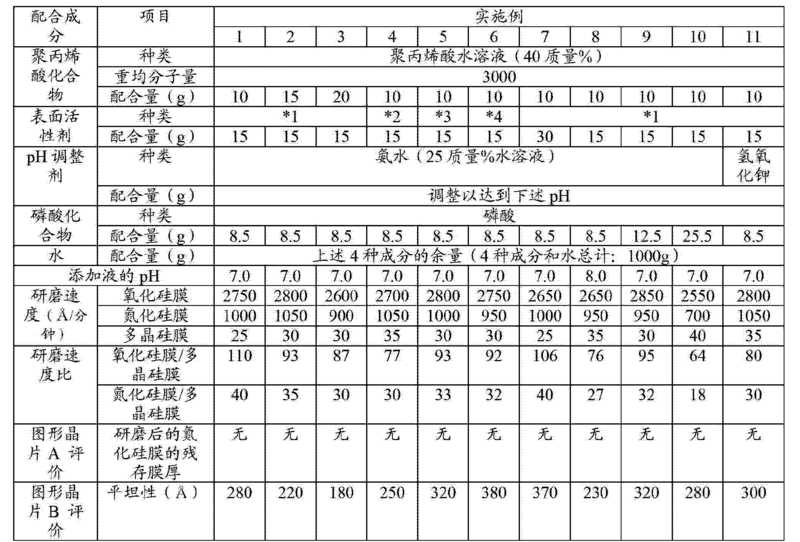 CMP polishing liquid according to claim 56, wherein, pH of the second solution is 7~12 6. 0. 81. 根据权利要求56所述的CMP研磨液，其中，所述第2液的pH为6. 8〜11. 0。 81. CMP polishing liquid according to claim 56, wherein, pH of the second solution is 8~11 6. 0. 82. 根据权利要求56所述的CMP研磨液，其中，进一步含有pH调整剂。 82. The CMP polishing liquid according to claim 56, further comprising a pH adjusting agent. 83. 根据权利要求82所述的CMP研磨液，其中，所述pH调整剂为pKa为8以上的碱性化合物。 83. CMP polishing liquid according to claim 82, wherein the pH adjusting agent having a pKa of 8 or more basic compounds. 84. 根据权利要求83所述的CMP研磨液，其中，所述pKa为8以上的碱性化合物为水溶性的有机胺、氨水。 84. CMP polishing liquid according to claim 83, wherein the pKa of 8 or more water-soluble organic basic compound is an amine, ammonia. 85. 根据权利要求84所述的CMP研磨液，其中，所述有机胺为乙胺、二乙胺、三乙胺、二苯胍、哌啶、丁胺、二丁胺、异丙胺、四甲基氢氧化铵、四甲基氯化铵、四甲基溴化铵、四甲基氟化铵、四丁基氢氧化铵、四丁基氯化铵、四丁基溴化铵、四丁基氟化铵、四甲基铵硝酸盐、 四甲基铵醋酸盐、四甲基铵丙酸盐、四甲基铵马来酸盐、四甲基铵硫酸盐。 85. CMP polishing liquid according to claim 84, wherein the organic amine is ethylamine, diethylamine, triethylamine, diphenyl guanidine, piperidine, butylamine, dibutylamine, diisopropylamine, tetramethylammonium ammonium hydroxide, tetramethyl ammonium chloride, tetramethyl ammonium bromide, tetramethylammonium fluoride, tetrabutylammonium hydroxide, tetrabutylammonium chloride, tetrabutylammonium bromide, tetrabutylammonium fluoride ammonium, tetramethyl ammonium nitrate, tetramethylammonium acetate, tetramethylammonium propionate, tetramethylammonium maleate, tetramethylammonium sulfate. 86. 根据权利要求82所述的CMP研磨液，其中，所述pH调整剂为碱性化合物，所述pH 调整剂的含量在以CMP研磨液总质量为基准时，为0. 01〜10. 0质量％。 86. CMP polishing liquid according to claim 82, wherein the pH adjusting agent is a basic compound, the content of the pH adjusting agent in the total mass of the CMP polishing liquid as a reference, 0. 01~10. 0% by mass. 87. 根据权利要求82所述的CMP研磨液，其中，所述pH调整剂为碱性化合物，所述pH 调整剂的含量在以CMP研磨液总质量为基准时，为0. 05〜5. 0质量％。 87. CMP polishing liquid according to claim 82, wherein the pH adjusting agent is a basic compound, the content of the pH adjusting agent in the total mass of the CMP polishing liquid as a reference, 0. 05~5. 0% by mass. 88. 根据权利要求82所述的CMP研磨液，其中，所述pH调整剂为碱性化合物，所述pH 调整剂的含量在以CMP研磨液总质量为基准时，为0. 1〜3. 0质量％。 88. CMP polishing liquid according to claim 82, wherein the pH adjusting agent is a basic compound, the content of the pH adjusting agent in the total mass of the CMP polishing liquid as a reference, 0. 1 ~ 3. 0% by mass. 89. 根据权利要求56所述的CMP研磨液，其中，所述聚丙烯酸化合物为由丙烯酸均聚物形成的聚丙烯酸、丙烯酸和水溶性的丙烯酸烷基酯的共聚物。 89. CMP polishing liquid according to claim 56, wherein said polyacrylic acid compound copolymer, a polyacrylic acid homopolymer of acrylic acid, acrylic acid and water-soluble by the alkyl acrylate. 90. 根据权利要求56所述的CMP研磨液，其中，所述聚丙烯酸化合物为聚丙烯酸、丙烯酸和丙烯酸甲酯的共聚物、丙烯酸和甲基丙烯酸的共聚物、丙烯酸和丙烯酸乙酯的共聚物。 90. The CMP polishing liquid according to claim 56, wherein said compound is a polyacrylic acid copolymer, polyacrylic acid, copolymers of acrylic acid and methyl acrylate, copolymers of acrylic and methacrylic acid, acrylic acid and ethyl acrylate . 91. 根据权利要求56所述的CMP研磨液，其中，所述聚丙烯酸化合物为聚丙烯酸。 91. The CMP polishing liquid according to claim 56, wherein said polyacrylic acid is a polyacrylic acid compound. 92. 根据权利要求56所述的CMP研磨液，其中，所述聚丙烯酸化合物的重均分子量为500000 以下。 92. CMP polishing liquid according to claim 56, wherein said polyacrylic acid compound weight average molecular weight of 500,000 or less. 93. 根据权利要求56所述的CMP研磨液，其中，所述聚丙烯酸化合物的重均分子量为50000以下。 93. CMP polishing liquid according to claim 56, wherein said polyacrylic acid compound weight-average molecular weight of 50,000 or less. 94. 根据权利要求56所述的CMP研磨液，其中，所述聚丙烯酸化合物的含量在以CMP研磨液总质量为基准时，为〇. 05〜2. 0质量％。 94. The CMP polishing liquid according to claim 56, wherein the content of polyacrylic acid compound in the total mass of the CMP polishing liquid as a reference for the square. 05~2. 0% by mass. 95. 根据权利要求56所述的CMP研磨液，其中，所述聚丙烯酸化合物的含量在以CMP研磨液总质量为基准时，为〇. 08〜1. 8质量％。 95. The CMP polishing liquid according to claim 56, wherein the content of polyacrylic acid compound in the total mass of the CMP polishing liquid as a reference for the square. 08~1. 8% by mass. 96. 根据权利要求56所述的CMP研磨液，其中，所述聚丙烯酸化合物的含量在以CMP研磨液总质量为基准时，为〇. 10〜1. 5质量％。 96. The CMP polishing liquid according to claim 56, wherein the content of polyacrylic acid compound in the total mass of the CMP polishing liquid as a reference for the square. 10~1. 5 mass%. 97. 根据权利要求56所述的CMP研磨液，其中，含有阴离子性表面活性剂、非离子性表面活性剂、阳离子性表面活性剂、两性离子性表面活性剂作为所述表面活性剂。 97. The CMP polishing liquid according to claim 56, wherein the surfactant comprises an anionic, nonionic surfactants, cationic surfactants, zwitterionic surfactants as the surfactant. 98. 根据权利要求56所述的CMP研磨液，其中，含有非离子性表面活性剂作为所述表面活性剂。 98. CMP polishing liquid according to claim 56, wherein, containing a nonionic surfactant as the surfactant. 99. 根据权利要求98所述的CMP研磨液，其中，所述非离子性表面活性剂为醚型表面活性剂、酯型表面活性剂、氨基醚型表面活性剂、醚酯型表面活性剂、烷醇酰胺型表面活性剂、 乙炔系二醇的环氧乙烷加成物、聚乙烯吡咯烷酮、聚丙烯酰胺、聚二甲基丙烯酰胺。 99. CMP polishing liquid according to claim 98, wherein said nonionic surfactant is an ether-type surfactants, ester surfactants, aminoether surfactants, ether ester type surfactants, alkanolamide surfactants, acetylene glycol-based ethylene oxide adduct, polyvinyl pyrrolidone, polyacrylamide, polydimethyl acrylamide. 100. 根据权利要求99所述的CMP研磨液，其中，所述醚型表面活性剂为聚氧丙烯、聚氧乙烯烷基醚、聚氧乙烯烷基烯丙基醚、聚氧乙烯聚氧丙烯醚衍生物、聚氧丙烯甘油基醚、聚乙二醇、甲氧基聚乙二醇、乙炔系二醇的环氧乙烷加成物。 100. CMP polishing liquid according to claim 99, wherein the ether type surfactant is a polyoxypropylene, polyoxyethylene alkyl ethers, polyoxyethylene alkyl allyl ether, polyoxyethylene polyoxypropylene ether derivative, polyoxypropylene glyceryl ether, polyethylene glycol, methoxy polyethylene glycol, an acetylene-based diol ethylene oxide adduct. 101. 根据权利要求99所述的CMP研磨液，其中，所述醚酯型表面活性剂为聚氧乙烯山梨糖醇酐脂肪酸酯、聚氧乙烯甘油硼酸酯脂肪酸酯、聚氧乙烯烷基酯。 101. CMP polishing liquid according to claim 99, wherein the ether ester type surfactant is a polyoxyethylene sorbitan fatty acid esters, sorbitan, polyoxyethylene glycerol borate fatty acid esters, polyoxyethylene alkyl ester. 102. 根据权利要求56所述的CMP研磨液，其中，所述表面活性剂的含量在以CMP研磨液总质量为基准时，为〇. 01〜1. 〇质量％。 102. CMP polishing liquid according to claim 56, wherein the content of the surfactant in the CMP polishing liquid to the total mass as a reference for the square. 01~1. Billion mass%. 103. 根据权利要求56所述的CMP研磨液，其中，所述表面活性剂的含量在以CMP研磨液总质量为基准时，为〇. 02〜0. 7质量％。 103. CMP polishing liquid according to claim 56, wherein the content of the surfactant in the CMP polishing liquid to the total mass as a reference for the square. 02~0. 7 mass%. 104. 根据权利要求56所述的CMP研磨液，其中，所述表面活性剂的含量在以CMP研磨液总质量为基准时，为〇. 03〜0. 5质量％。 104. CMP polishing liquid according to claim 56, wherein the content of the surfactant in the CMP polishing liquid to the total mass as a reference for the square. 03~0. 5 mass%. 105. 根据权利要求56所述的CMP研磨液，其中，所述磷酸化合物为磷酸。 105. CMP polishing liquid according to claim 56, wherein said phosphate compound is phosphoric acid. 106. 根据权利要求56所述的CMP研磨液，其中，所述磷酸化合物为磷酸衍生物。 106. CMP polishing liquid according to claim 56, wherein said phosphoric acid compound is a phosphoric acid derivative. 107. 根据权利要求106所述的CMP研磨液，其中，所述磷酸衍生物为磷酸聚合物、磷酸氢钠、磷酸钠、磷酸铵、磷酸钾、磷酸钙、焦磷酸钠、聚磷酸、聚磷酸钠、偏磷酸、偏磷酸钠、磷酸铵。 107. CMP polishing liquid according to claim 106, wherein the acid is phosphoric acid derivative polymers, sodium hydrogen phosphate, sodium phosphate, ammonium phosphate, potassium phosphate, calcium phosphate, sodium pyrophosphate, polyphosphoric acid, polyphosphoric acid sodium metaphosphate, sodium metaphosphate, ammonium. 108. 根据权利要求56所述的CMP研磨液，其中，所述磷酸化合物的含量在以CMP研磨液总质量为基准时，为〇. 01〜1. 〇质量％。 108. CMP polishing liquid according to claim 56, wherein the content of the phosphate compound in the total mass of the CMP polishing liquid as a reference for the square. 01~1. Billion mass%. 109. 根据权利要求56所述的CMP研磨液，其中，所述磷酸化合物的含量在以CMP研磨液总质量为基准时，为〇. 02〜0. 7质量％。 109. CMP polishing liquid according to claim 56, wherein the content of the phosphate compound in the total mass of the CMP polishing liquid as a reference for the square. 02~0. 7 mass%. 110. 根据权利要求56所述的CMP研磨液，其中，所述磷酸化合物的含量在以CMP研磨液总质量为基准时，为〇. 03〜0. 5质量％。 110. CMP polishing liquid according to claim 56, wherein the content of the phosphate compound in the total mass of the CMP polishing liquid as a reference for the square. 03~0. 5 mass%. 111. 根据权利要求1〜110中任一项所述的CMP研磨液，用于：以形成有氧化娃膜或氮化硅膜中的至少一方的被研磨膜和多晶硅膜的基板中的该多晶硅膜为截止膜，研磨除去所述被研磨膜的至少一部分。 1~110 111. CMP polishing liquid according to any one of claim 1, for: a substrate to form an oxide film or a silicon nitride film baby at least one of a polysilicon film to be polished and the polysilicon film cutoff membrane film, is polished to remove at least a portion of the polished film. 112. 根据权利要求1〜110中任一项所述的CMP研磨液，用于研磨除去氮化娃膜的至少一部分。 112. CMP polishing liquid according to any one of 1~110 claims, for removing at least a portion of the nitride film polishing baby. 113. 根据权利要求1〜110中任一项所述的CMP研磨液，用于研磨除去氧化娃膜的至少一部分和氮化硅膜的至少一部分。 113. CMP polishing liquid according to any one of 1~110 claims, for removing at least part of at least part of oxide film and the silicon nitride film polishing baby. 114. 一种基板的研磨方法，其具备使用权利要求1〜110中任一项所述的CMP研磨液， 对至少一个面上形成有被研磨膜的基板的该被研磨膜进行研磨的研磨工序。 114. A method of polishing a substrate, comprising using the CMP polishing liquid according to claim any one of 1~110, and the substrate film to be polished to be polished of the polishing step of polishing a film formed on at least one surface . 115. -种基板研磨方法，其具备研磨液制备工序：将含有包含氧化铈粒子的铈系研磨粒、分散剂和水且pH为7. 0以上的第1液、与含有聚丙烯酸化合物、表面活性剂、磷酸或磷酸衍生物中的至少一方的磷酸化合物和水且pH为6. 5以上的第2液混合，获得所述磷酸化合物的含量在以CMP研磨液总质量为基准时为0. 01〜1. 0质量％的CMP研磨液；和研磨工序：使用所述CMP研磨液，对在至少一个面上形成有被研磨膜的基板的该被研磨膜进行研磨。 115. - kind of substrate polishing method comprising polishing solution preparation step: containing a cerium-based abrasive grain comprising cerium oxide particles, a dispersant and water and having a pH of 7.0 or more first liquid, containing a polyacrylic acid compound, surface active agent, phosphoric acid derivatives, or at least one phosphoric acid compound and water and having a pH of 6.5 or more second solutions are mixed to obtain the content of the phosphate compound is 0 when the total mass of the CMP polishing liquid as a reference. . 01~1 0 mass% of the CMP polishing liquid; and polishing steps of: using the CMP polishing liquid for the film to be polished with a film to be polished formed of a substrate at least one surface is polished. 116. 根据权利要求115所述的基板研磨方法，其中，所述第1液的pH为7. 0〜12. 0。 116. The method of polishing a substrate according to claim 115, wherein, pH of the first liquid 7. 0~12 0. 117. 根据权利要求115所述的基板研磨方法，其中，所述第1液的pH为7.0〜11.0。 117. The method of polishing a substrate according to claim 115, wherein, pH of the first solution is 7.0~11.0. 118. 根据权利要求115所述的基板研磨方法，其中，所述铈系研磨粒由氧化铈粒子构成。 118. The method of polishing a substrate according to claim 115, wherein the cerium-based abrasive grains composed of cerium oxide particles. 119. 根据权利要求115所述的基板研磨方法，其中，所述氧化铈粒子为通过烧成或氧化法而制造的粒子。 119. The method of polishing a substrate according to claim 115, wherein the particles of the cerium oxide particles by oxidation or calcination manufactured. 120. 根据权利要求115所述的基板研磨方法，其中，所述氧化铈粒子为通过对铈化合物进行氧化而获得的粒子，所述铈化合物为碳酸盐、硝酸盐、硫酸盐、草酸盐。 120. The method of polishing a substrate according to claim 115, wherein said particles are cerium oxide particles by oxidizing cerium compound obtained by the cerium compound is a carbonate, nitrate, sulfate, oxalate . 121. 根据权利要求119所述的基板研磨方法，其中，所述烧成的温度为350〜900°C。 121. The method of polishing a substrate according to claim 119, wherein the firing temperature is 350~900 ° C.
122. 根据权利要求115所述的基板研磨方法，其中，所述铈系研磨粒含有具有晶界的多晶体铺系研磨粒。 122. The method of polishing a substrate according to claim 115, wherein said abrasive grains containing cerium-based abrasive grains having a polycrystalline plated grain boundaries. 125. 根据权利要求115所述的基板研磨方法，其中，所述铈系研磨粒的平均粒径为0. 08 〜0. 5 μ m。 125. The method of polishing a substrate according to claim 115, wherein the average particle diameter of the cerium-based abrasive grain is 0. 08 ~0. 5 μ m.
126. 根据权利要求115所述的基板研磨方法，其中，所述铈系研磨粒的平均粒径为0. 08 〜0. 4 μ m。 126. The method of polishing a substrate according to claim 115, wherein the average particle diameter of the cerium-based abrasive grain is 0. 08 ~0. 4 μ m.
127. 根据权利要求115所述的基板研磨方法，其中，所述铈系研磨粒的含量在以CMP研磨液总质量为基准时，为〇. 2〜3. 0质量％。 127. The method of polishing a substrate according to claim 115, wherein the content of the cerium-based abrasive grains when the total mass of the CMP polishing liquid as a reference for the square. 2 ~. 0% by mass. 128. 根据权利要求115所述的基板研磨方法，其中，所述铈系研磨粒的含量在以CMP研磨液总质量为基准时，为〇. 3〜2. 0质量％。 128. The method of polishing a substrate according to claim 115, wherein the content of the cerium-based abrasive grains when the total mass of the CMP polishing liquid as a reference for the square. 3~2. 0% by mass. 129. 根据权利要求115所述的基板研磨方法，其中，所述铈系研磨粒的含量在以CMP研磨液总质量为基准时，为〇. 5〜1. 5质量％。 129. The method of polishing a substrate according to claim 115, wherein the content of the cerium-based abrasive grains when the total mass of the CMP polishing liquid as a reference for the square. 5~1. 5 mass%. 130. 根据权利要求115所述的基板研磨方法，其中，对于所述第1液，作为所述分散剂为水溶性阴离子性分散剂、水溶性非离子性分散剂、水溶性阳离子性分散剂、水溶性两性分散剂。 130. The method of polishing a substrate according to claim 115, wherein, for the first liquid, as the dispersing agent is a water-soluble anionic dispersant, a water-soluble nonionic dispersant, a water-soluble cationic dispersant, water-soluble amphoteric dispersant. 131. 根据权利要求130所述的基板研磨方法，其中，所述水溶性阴离子性分散剂为月桂基硫酸三乙醇胺、月桂基硫酸铵、聚氧乙烯烷基醚硫酸三乙醇胺、聚羧酸型高分子分散剂。 131. The method of polishing a substrate according to claim 130, wherein said water-soluble anionic dispersing agent is triethanolamine lauryl sulfate, ammonium lauryl sulfate, polyoxyethylene alkyl ether sulfuric acid triethanol amine, polycarboxylic acid type high molecular dispersant. 132. 根据权利要求115所述的基板研磨方法，其中，所述第1液含有聚羧酸型高分子分散剂作为所述分散剂。 132. The method of polishing a substrate according to claim 115, wherein said first liquid containing a polycarboxylic acid type polymeric dispersant as the dispersant. 133. 根据权利要求132所述的基板研磨方法，其中，所述聚羧酸型高分子分散剂的重均分子量为100000以下。 Weight 133. The substrate polishing method according to claim 132, wherein said polycarboxylic acid type polymer dispersant average molecular weight of 100,000 or less. 134. 根据权利要求132所述的基板研磨方法，其中，所述聚羧酸型高分子分散剂为具有不饱和双键的羧酸单体的聚合物、具有不饱和双键的羧酸单体和其它具有不饱和双键的单体的共聚物以及它们的铵盐、胺盐。 134. The method of polishing a substrate according to claim 132, wherein said polycarboxylic acid type polymer dispersant is a polymer having an unsaturated double bond of carboxylic acid monomer, an unsaturated carboxylic acid monomer double bond and other copolymers of monomers having an unsaturated double bond and their ammonium salts, amine salts. 135. 根据权利要求134所述的基板研磨方法，其中，所述具有不饱和双键的羧酸单体为丙烯酸、甲基丙烯酸、马来酸、富马酸、衣康酸。 135. The method of polishing a substrate according to claim 134, wherein said carboxylic acid having an unsaturated double bond monomers are acrylic acid, methacrylic acid, maleic acid, fumaric acid, itaconic acid. 136. 根据权利要求115所述的基板研磨方法，其中，所述第1液含有聚丙烯酸系分散剂作为所述分散剂。 136. The method of polishing a substrate according to claim 115, wherein said first liquid containing a polyacrylic acid dispersant as the dispersant. 137. 根据权利要求136所述的基板研磨方法，其中，所述聚丙烯酸系分散剂为以丙烯酸铵盐作为构成单元的高分子分散剂。 137. The method of polishing a substrate according to claim 136, wherein said dispersant is a polyacrylic acid ammonium salt of acrylic acid as a constituent unit of the polymer dispersant. 138. 根据权利要求137所述的基板研磨方法，其中，所述以丙烯酸铵盐作为构成单元的高分子分散剂为聚丙烯酸铵盐、丙烯酸烷基酯与丙烯酸的共聚物的铵盐。 138. The method of polishing a substrate according to claim 137, wherein said acrylic acid ammonium salt as a constituent unit of the polymer dispersant is polyacrylic acid ammonium salt, an ammonium salt of a copolymer of alkyl acrylate and acrylic acid. 139. 根据权利要求115所述的基板研磨方法，其中，所述第2液的pH为6. 7〜12. 0。 139. The method of polishing a substrate according to claim 115, wherein, pH of the second solution is 7~12 6. 0. 140. 根据权利要求115所述的基板研磨方法，其中，所述第2液的pH为6. 8〜11. 0。 140. The method of polishing a substrate according to claim 115, wherein, pH of the second solution is 8~11 6. 0. 141. 根据权利要求115所述的基板研磨方法，其中，所述第2液进一步含有pH调整剂。 141. The method of polishing a substrate according to claim 115, wherein the second liquid further comprises a pH adjusting agent. 142. 根据权利要求141所述的基板研磨方法，其中，所述pH调整剂为pKa为8以上的碱性化合物。 142. The method of polishing a substrate according to claim 141, wherein the pH adjusting agent having a pKa of 8 or more basic compounds. 143. 根据权利要求142所述的基板研磨方法，其中，所述pKa为8以上的碱性化合物为水溶性的有机胺、氨水。 143. The method of polishing a substrate according to claim 142, wherein the pKa of 8 or more water-soluble organic basic compound is an amine, ammonia. 144. 根据权利要求143所述的基板研磨方法，其中，所述有机胺为乙胺、二乙胺、三乙胺、二苯胍、哌啶、丁胺、二丁胺、异丙胺、四甲基氢氧化铵、四甲基氯化铵、四甲基溴化铵、四甲基氟化铵、四丁基氢氧化铵、四丁基氯化铵、四丁基溴化铵、四丁基氟化铵、四甲基铵硝酸盐、四甲基铵醋酸盐、四甲基铵丙酸盐、四甲基铵马来酸盐、四甲基铵硫酸盐。 144. The method of polishing a substrate according to claim 143, wherein the organic amine is ethylamine, diethylamine, triethylamine, diphenyl guanidine, piperidine, butylamine, dibutylamine, diisopropylamine, tetramethylammonium ammonium hydroxide, tetramethyl ammonium chloride, tetramethyl ammonium bromide, tetramethylammonium fluoride, tetrabutylammonium hydroxide, tetrabutylammonium chloride, tetrabutylammonium bromide, tetrabutylammonium fluoride ammonium, tetramethyl ammonium nitrate, tetramethylammonium acetate, tetramethylammonium propionate, tetramethylammonium maleate, tetramethylammonium sulfate. 145. 根据权利要求141所述的基板研磨方法，其中，所述pH调整剂为碱性化合物，所述pH调整剂的含量在以基板研磨方法总质量为基准时，为0. 01〜10. 0质量％。 145. The method of polishing a substrate according to claim 141, wherein the pH adjusting agent is a basic compound, the content of the pH adjusting agent in the total mass of the substrate polishing method as a reference 0. 01~10. 0% by mass. 146. 根据权利要求141所述的基板研磨方法，其中，所述pH调整剂为碱性化合物，所述pH调整剂的含量在以CMP研磨液总质量为基准时，为0. 05〜5. 0质量％。 146. The method of polishing a substrate according to claim 141, wherein the pH adjusting agent is a basic compound, the content of the pH adjusting agent in the total mass of the CMP polishing liquid as a reference, 0. 05~5. 0% by mass. 147. 根据权利要求141所述的基板研磨方法，其中，所述pH调整剂为碱性化合物，所述pH调整剂的含量在以CMP研磨液总质量为基准时，为0. 1〜3.0质量％。 When the substrate 147. The polishing method according to claim 141, wherein the pH adjusting agent is a basic compound, the content of the pH adjusting agent in the total mass of the CMP polishing liquid as a reference, quality 0. 1~3.0 %. 148. 根据权利要求115所述的基板研磨方法，其中，所述第2液所含有的所述聚丙烯酸化合物为由丙烯酸均聚物形成的聚丙烯酸、丙烯酸和水溶性的丙烯酸烷基酯的共聚物。 148. The method of polishing a substrate copolymer according to claim 115, wherein the compound of the polyacrylic acid contained in the second liquid by the formation of homopolymer of acrylic acid, polyacrylic acid, acrylic acid and water-soluble acrylic acid alkyl esters thereof. 149. 根据权利要求115所述的基板研磨方法，其中，所述第2液所含有的所述聚丙烯酸化合物为聚丙烯酸、丙烯酸和丙烯酸甲酯的共聚物、丙烯酸和甲基丙烯酸的共聚物、丙烯酸和丙烯酸乙酯的共聚物。 149. The method of polishing a substrate according to claim 115, wherein said polyacrylic acid compound contained in the second liquid is a copolymer of polyacrylic acid, copolymers of acrylic acid and methyl acrylate, acrylic acid and methacrylic acid, copolymers of acrylic acid and ethyl acrylate. 150. 根据权利要求115所述的基板研磨方法，其中，所述第2液所含有的所述聚丙烯酸化合物为聚丙烯酸。 150. The method of polishing a substrate according to claim 115, wherein the compound of the polyacrylic acid contained in the second liquid is polyacrylic acid. 151. 根据权利要求115所述的基板研磨方法，其中，所述第2液所含有的所述聚丙烯酸化合物的重均分子量为500000以下。 151. The method of polishing a substrate according to claim 115, wherein the weight of the polyacrylic acid compound contained in the second liquid-average molecular weight of 500,000 or less. 152. 根据权利要求115所述的基板研磨方法，其中，所述第2液所含有的所述聚丙烯酸化合物的重均分子量为50000以下。 152. The method of polishing a substrate according to claim 115, wherein the weight of the polyacrylic acid compound contained in the second liquid-average molecular weight of 50,000 or less. 153. 根据权利要求115所述的基板研磨方法，其中，所述第2液所含有的所述聚丙烯酸化合物的含量在以CMP研磨液总质量为基准时，为0. 05〜2. 0质量％。 153. The method of polishing a substrate according to claim 115, wherein the content of the polyacrylic acid compound contained in the second liquid in the total mass of the CMP polishing liquid as a reference, 0. 05~2. 0 mass %. 154. 根据权利要求115所述的基板研磨方法，其中，所述第2液所含有的所述聚丙烯酸化合物的含量在以CMP研磨液总质量为基准时，为0. 08〜1. 8质量％。 154. The method of polishing a substrate according to claim 115, wherein the content of the polyacrylic acid compound contained in the second liquid in the total mass of the CMP polishing liquid as a reference, 0. 08~1. 8 mass %. 155. 根据权利要求115所述的基板研磨方法，其中，所述第2液所含有的所述聚丙烯酸化合物的含量在以CMP研磨液总质量为基准时，为0. 10〜1. 5质量％。 155. The method of polishing a substrate according to claim 115, wherein the content of the polyacrylic acid compound contained in the second liquid in the total mass of the CMP polishing liquid as a reference, 0. 10~1. 5 mass %. 156. 根据权利要求115所述的基板研磨方法，其中，所述第2液含有阴离子性表面活性齐U、非离子性表面活性剂、阳离子性表面活性剂、两性离子性表面活性剂作为所述表面活性剂。 156. The method of polishing a substrate according to claim 115, wherein said second liquid containing an anionic surfactant together U, as the non-ionic surfactants, cationic surfactants, zwitterionic surfactants Surfactant. 157. 根据权利要求115所述的基板研磨方法，其中，所述第2液含有非离子性表面活性剂作为所述表面活性剂。 157. The method of polishing a substrate according to claim 115, wherein the second liquid contains a nonionic surfactant as the surfactant. 158. 根据权利要求157所述的基板研磨方法，其中，所述非离子性表面活性剂为醚型表面活性剂、酯型表面活性剂、氨基醚型表面活性剂、醚酯型表面活性剂、烷醇酰胺型表面活性剂、乙炔系二醇的环氧乙烷加成物、聚乙烯吡咯烷酮、聚丙烯酰胺、聚二甲基丙烯酰胺。 158. The method of polishing a substrate according to claim 157, wherein said nonionic surfactant is an ether-type surfactants, ester surfactants, aminoether surfactants, ether ester type surfactants, alkanolamide surfactants, acetylene glycol-based ethylene oxide adduct, polyvinyl pyrrolidone, polyacrylamide, polydimethyl acrylamide. 159. 根据权利要求158所述的基板研磨方法，其中，所述醚型表面活性剂为聚氧丙烯、 聚氧乙烯烷基醚、聚氧乙烯烷基烯丙基醚、聚氧乙烯聚氧丙烯醚衍生物、聚氧丙烯甘油基醚、聚乙二醇、甲氧基聚乙二醇、乙炔系二醇的环氧乙烷加成物。 159. The method of polishing a substrate according to claim 158, wherein the ether type surfactant is a polyoxypropylene, polyoxyethylene alkyl ethers, polyoxyethylene alkyl allyl ether, polyoxyethylene polyoxypropylene ether derivative, polyoxypropylene glyceryl ether, polyethylene glycol, methoxy polyethylene glycol, an acetylene-based diol ethylene oxide adduct. 160. 根据权利要求158所述的基板研磨方法，其中，所述醚酯型表面活性剂为聚氧乙烯山梨糖醇酐脂肪酸酯、聚氧乙烯甘油硼酸酯脂肪酸酯、聚氧乙烯烷基酯。 160. The method of polishing a substrate according to claim 158, wherein the ether ester type surfactant is a polyoxyethylene sorbitan fatty acid esters, sorbitan, polyoxyethylene glycerol borate fatty acid esters, polyoxyethylene alkyl ester. 161. 根据权利要求115所述的基板研磨方法，其中，所述表面活性剂的含量在以CMP研磨液总质量为基准时，为〇. 01〜1. 〇质量％。 161. The method of polishing a substrate according to claim 115, wherein the content of the surfactant in the CMP polishing liquid to the total mass as a reference for the square. 01~1. Billion mass%. 162. 根据权利要求115所述的基板研磨方法，其中，所述表面活性剂的含量在以CMP研磨液总质量为基准时，为〇. 02〜0. 7质量％。 162. The method of polishing a substrate according to claim 115, wherein the content of the surfactant in the CMP polishing liquid to the total mass as a reference for the square. 02~0. 7 mass%. 163. 根据权利要求115所述的基板研磨方法，其中，所述表面活性剂的含量在以CMP研磨液总质量为基准时，为〇. 03〜0. 5质量％。 163. The method of polishing a substrate according to claim 115, wherein the content of the surfactant in the CMP polishing liquid to the total mass as a reference for the square. 03~0. 5 mass%. 164. 根据权利要求115所述的基板研磨方法，其中，所述磷酸化合物为磷酸。 164. The method of polishing a substrate according to claim 115, wherein said phosphate compound is phosphoric acid. 165. 根据权利要求115所述的基板研磨方法，其中，所述磷酸化合物为磷酸衍生物。 165. The method of polishing a substrate according to claim 115, wherein said phosphoric acid compound is a phosphoric acid derivative. 166. 根据权利要求165所述的基板研磨方法，其中，所述磷酸衍生物为磷酸聚合物、磷酸氢钠、磷酸钠、磷酸铵、磷酸钾、磷酸钙、焦磷酸钠、聚磷酸、聚磷酸钠、偏磷酸、偏磷酸钠、 磷酸铵。 166. The method of polishing a substrate according to claim 165, wherein the acid is phosphoric acid derivative polymers, sodium hydrogen phosphate, sodium phosphate, ammonium phosphate, potassium phosphate, calcium phosphate, sodium pyrophosphate, polyphosphoric acid, polyphosphoric acid sodium metaphosphate, sodium metaphosphate, ammonium. 167. 根据权利要求115所述的基板研磨方法，其中，所述磷酸化合物的含量在以CMP研磨液总质量为基准时，为〇. 01〜1. 〇质量％。 167. The method of polishing a substrate according to claim 115, wherein the content of the phosphate compound in the total mass of the CMP polishing liquid as a reference for the square. 01~1. Billion mass%. 168. 根据权利要求115所述的基板研磨方法，其中，所述磷酸化合物的含量在以CMP研磨液总质量为基准时，为〇. 02〜0. 7质量％。 168. The method of polishing a substrate according to claim 115, wherein the content of the phosphate compound in the total mass of the CMP polishing liquid as a reference for the square. 02~0. 7 mass%. 169. 根据权利要求115所述的基板研磨方法，其中，所述磷酸化合物的含量在以CMP研磨液总质量为基准时，为〇. 03〜0. 5质量％。 169. The method of polishing a substrate according to claim 115, wherein the content of the phosphate compound in the total mass of the CMP polishing liquid as a reference for the square. 03~0. 5 mass%. 170. 根据权利要求114所述的基板研磨方法，其中，所述基板的所述一个面具有高度差。 170. The method of polishing a substrate according to claim 114, wherein the surface of the substrate having a difference in height. 171. 根据权利要求115〜169中任一项所述的基板研磨方法，其中，所述基板的所述一个面具有高度差。 171. The method of polishing a substrate according to any one of claims 115~169, wherein the surface of the substrate having a difference in height. 172. 根据权利要求114所述的基板研磨方法，其中，在所述基板上形成有氧化硅膜或氮化硅膜中的至少一方作为所述被研磨膜， 所述基板与所述被研磨膜之间形成有多晶硅膜， 在所述研磨工序中，以所述多晶硅膜为截止膜，研磨除去所述被研磨膜的至少一部分。 172. The method of polishing a substrate according to claim 114, wherein at least one is formed as a film to be polished of the silicon oxide film or a silicon nitride film on the substrate, the substrate and the film to be polished is formed between a polysilicon film, the polishing step, the polysilicon film is cut to a film, removing the polishing film to be polished at least a portion. 173. 根据权利要求115〜169中任一项所述的基板研磨方法，其中，在所述基板上形成有氧化硅膜或氮化硅膜中的至少一方作为所述被研磨膜， 所述基板与所述被研磨膜之间形成有多晶硅膜， 在所述研磨工序中，以所述多晶硅膜为截止膜，研磨除去所述被研磨膜的至少一部分。 115~169 173. The substrate polishing method according to any one of claims, wherein at least one side is formed as a film to be polished of the silicon oxide film or a silicon nitride film on the substrate, the substrate is formed between the film and the polysilicon film is polished in the polishing step, the polysilicon film is cut to a film, removing the polishing film to be polished at least a portion. 174. 根据权利要求114所述的基板研磨方法，其中，在所述基板上形成有氮化硅膜作为所述被研磨膜， 在所述研磨工序中，研磨除去所述氮化硅膜的至少一部分。 174. The method of polishing a substrate according to claim 114, wherein the silicon nitride film formed on the substrate as the film to be polished, the polishing step, polishing of the silicon nitride film is removed at least portion. 175. 根据权利要求115〜169中任一项所述的基板研磨方法，其中，在所述基板上形成有氮化硅膜作为所述被研磨膜， 在所述研磨工序中，研磨除去所述氮化硅膜的至少一部分。 175. The method of polishing a substrate according to any one 115~169 claims, wherein the film to be polished is formed on the silicon nitride film as the substrate, in the grinding step, the grinding removing the at least a portion of the silicon nitride film. 176. 根据权利要求114所述的基板研磨方法，其中，在所述基板上形成有氧化硅膜和氮化硅膜作为所述被研磨膜， 在所述研磨工序中，研磨除去氧化硅膜的至少一部分和氮化硅膜的至少一部分。 176. The method of polishing a substrate according to claim 114, wherein there is formed a silicon oxide film and a silicon nitride film on the substrate as the film to be polished, the polishing step, polishing the silicon oxide film is removed and at least a portion of at least a portion of the silicon nitride film. 177. 根据权利要求115〜169中任一项所述的基板研磨方法，其中，在所述基板上形成有氧化硅膜和氮化硅膜作为所述被研磨膜， 在所述研磨工序中，研磨除去氧化硅膜的至少一部分和氮化硅膜的至少一部分。 177. The method of polishing a substrate according to any one 115~169 claims, wherein there is formed a silicon oxide film and a silicon nitride film on the substrate as the film to be polished, the polishing step, removing at least a portion of the silicon nitride film and a silicon oxide film at least a portion of the polishing. 178. 根据权利要求114所述的基板研磨方法，其中，在所述研磨工序中，在将至少一个面上形成有被研磨膜的基板的该被研磨膜按压在研磨平台的研磨布上的状态下，一边将所述CMP研磨液供给到所述被研磨膜和所述研磨布之间，一边使所述基板和所述研磨平台相对移动，从而对所述被研磨膜进行研磨。 178. The method of polishing a substrate according to claim 114, wherein, in the polishing process, the pressing is formed at least on the polishing platen of the polishing cloth substrate to be polished state of the film surface of a film to be polished lower, while the CMP polishing liquid is supplied to the abrasive between the film and the polishing cloth while polishing the substrate and the platform relative movement, thereby polishing the film to be polished. 179. 根据权利要求115〜169中任一项所述的基板研磨方法，其中，在所述研磨工序中，在将至少一个面上形成有被研磨膜的基板的该被研磨膜按压在研磨平台的研磨布上的状态下，一边将所述CMP研磨液供给到所述被研磨膜和所述研磨布之间，一边使所述基板和所述研磨平台相对移动，从而对所述被研磨膜进行研磨。 115~169 179. The substrate polishing method according to any one of claims, wherein in said polishing step, at least one surface of the substrate formed with the film to be polished is pressed against the polishing platform polished film state on the polishing cloth while supplying the CMP polishing liquid to be polished between the film and the polishing cloth while polishing the substrate and the platform moving relative to the film to be polished ground. 180. 根据权利要求114所述的基板研磨方法，其中，在所述基板和所述被研磨膜之间形成有多晶娃月吴， 在所述研磨工序中，以所述多晶硅膜作为截止膜对所述被研磨膜进行研磨。 180. The method of polishing a substrate according to claim 114, wherein is formed between the polycrystalline abrasive Wu Wa months in the substrate and the film, in the polishing step, the polysilicon film as the cutoff membrane the film to be polished is polished. 181. 根据权利要求115〜169中任一项所述的基板研磨方法，其中，在所述基板和所述被研磨膜之间形成有多晶硅膜， 在所述研磨工序中，以所述多晶硅膜作为截止膜对所述被研磨膜进行研磨。 181. The method of polishing a substrate according to any one 115~169 claims, wherein, in the substrate and the polysilicon film is formed between the polished film, in the polishing step, the polysilicon film to as the film off the film to be polished is polished. 182. 根据权利要求114所述的基板研磨方法，其中，在所述基板上形成有氧化硅膜或氮化硅膜中的至少一方作为所述被研磨膜。 182. The method of polishing a substrate according to claim 114, wherein at least one is formed as a film to be polished of the silicon oxide film or a silicon nitride film on the substrate. 183.根据权利要求115〜169中任一项所述的基板研磨方法，其中，在所述基板上形成有氧化硅膜或氮化硅膜中的至少一方作为所述被研磨膜。 183. The method of polishing a substrate according to any one of claims 115~169, wherein at least one is formed as a film to be polished of the silicon oxide film or a silicon nitride film on the substrate. Free format text: CORRECT: APPLICANT; FROM: HITACHI CHEMICAL CO. LTD. TO: HITACHI CHEMICAL CO., LTD.